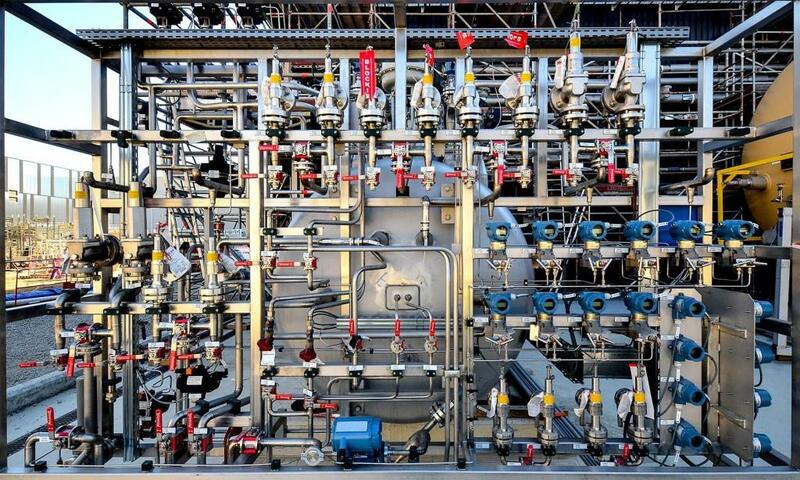 This complex set of hand valves and local readings of pressure, temperature and flow is part of the cooling loop that maintains the temperature inside the cryoplant's quench tanks at 100 K.
INOXCVA in India is producing about half of the 5 km of cryolines needed for ITER (700 "spools") for the Indian Domestic Agency. 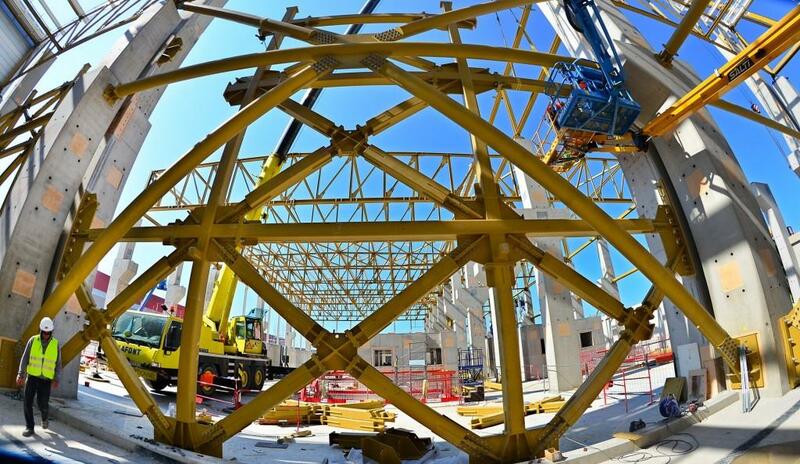 Eighty percent have all kinds of angles, bends and turns. 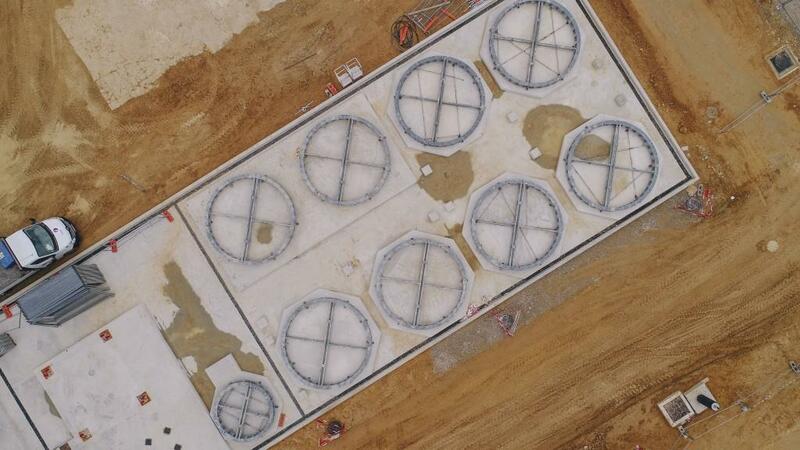 Aligned in three rows, each one linked to a helium cold box, the helium compressors installed on tall concrete pads will supply the cold boxes with gaseous helium at 21.8 bars. 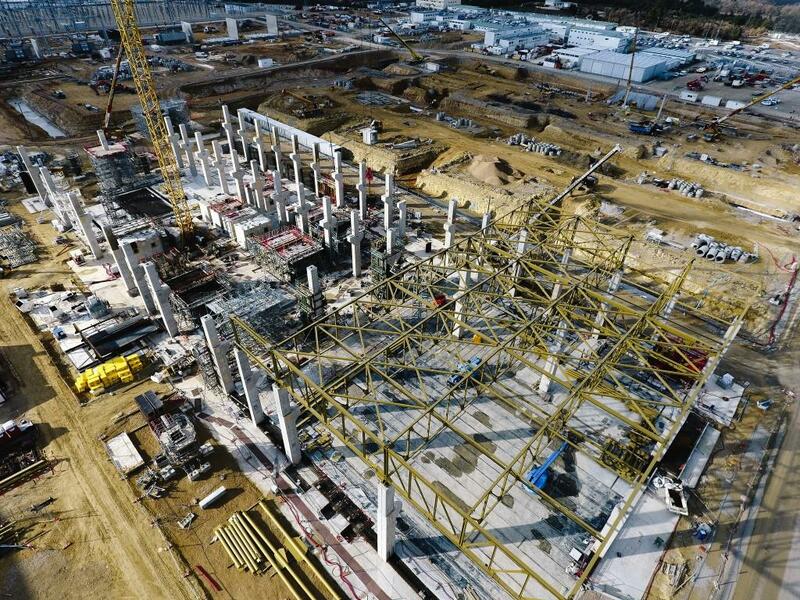 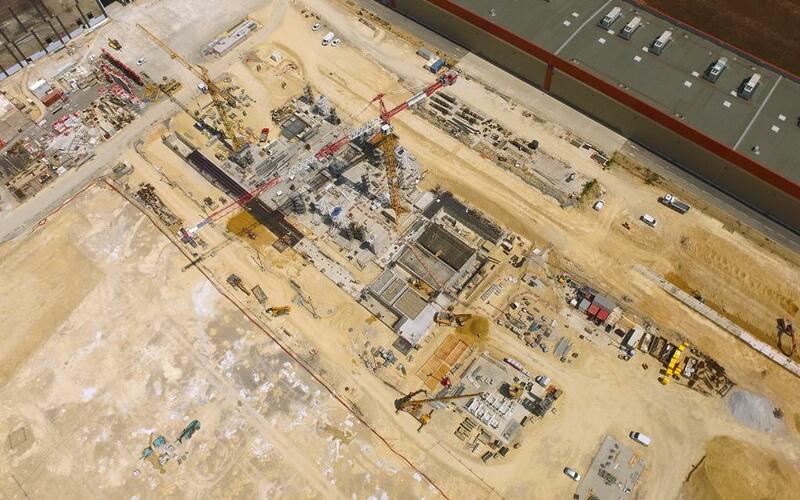 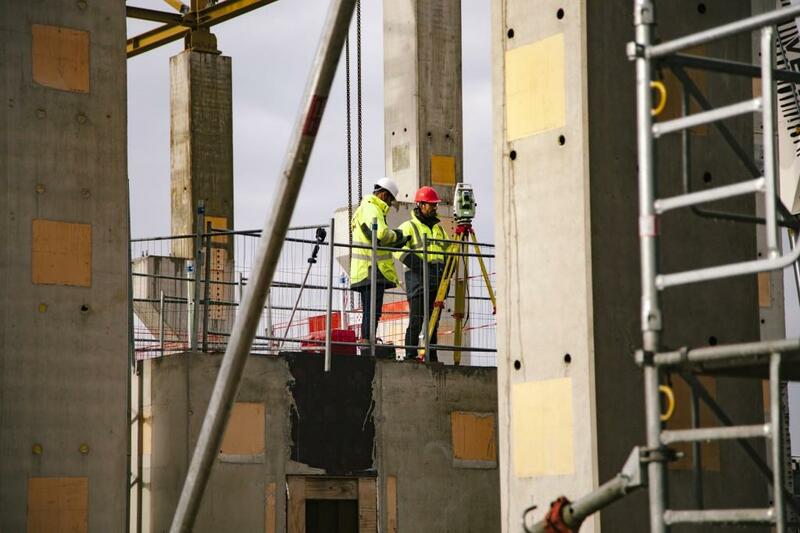 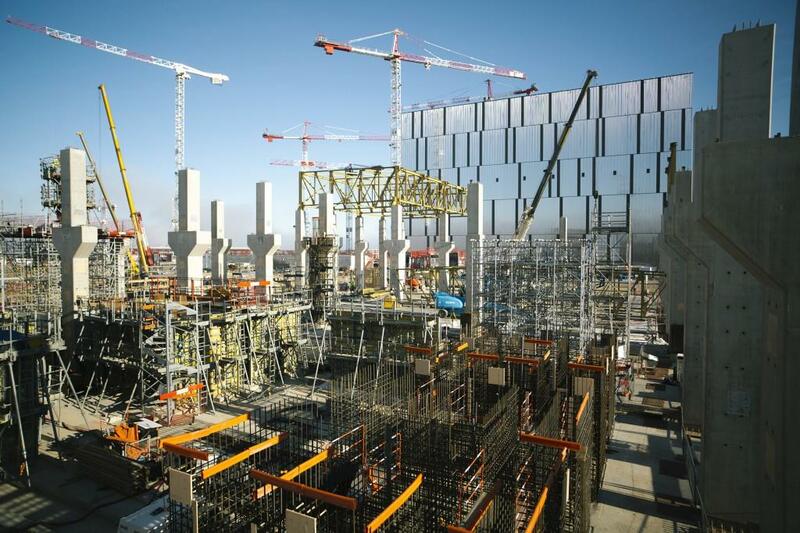 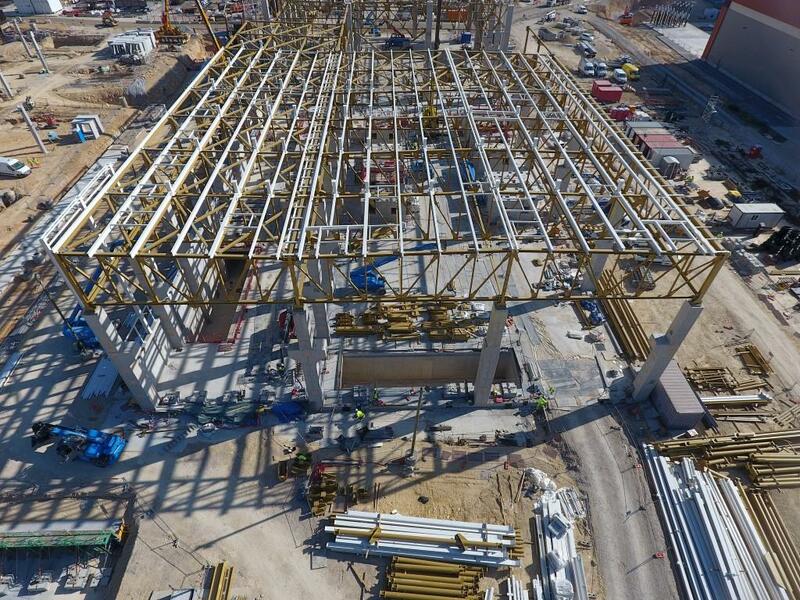 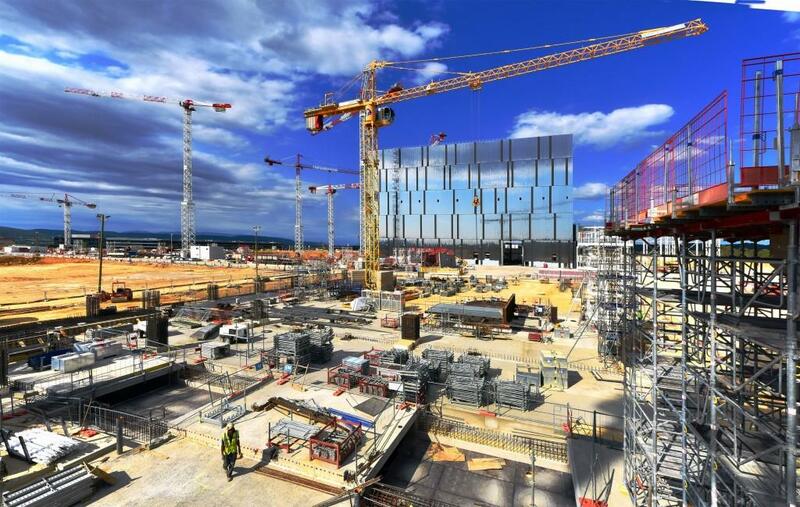 Close coordination is required of the different teams representing the ITER Organization, the European Domestic Agency, equipment manufacturer Air Liquide, mechanical installation contractors, and ITER's Construction Management-as-Agent. 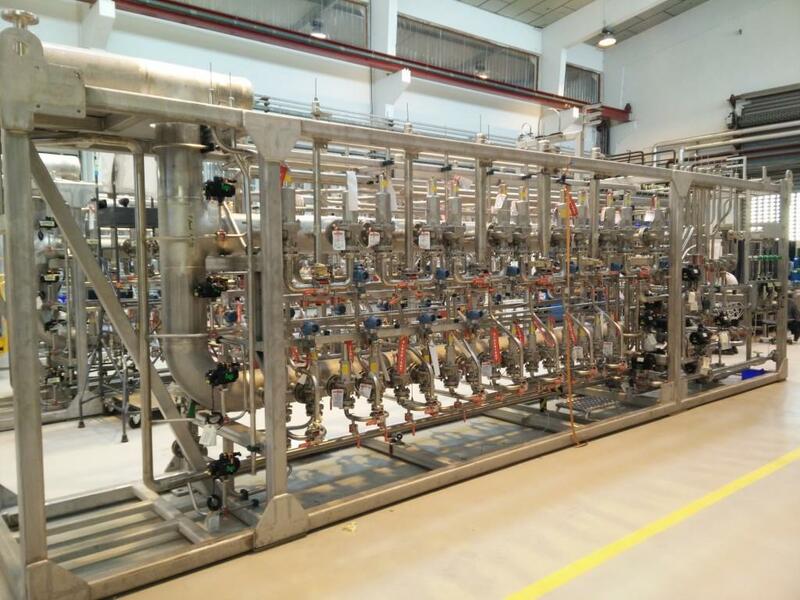 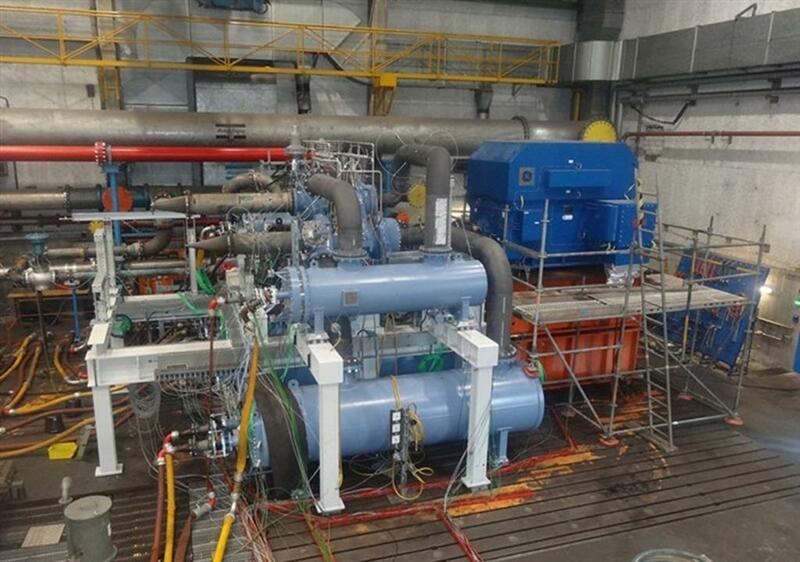 For the nitrogen plant, the first phase of centrifugal compressor installation was achieved this month. 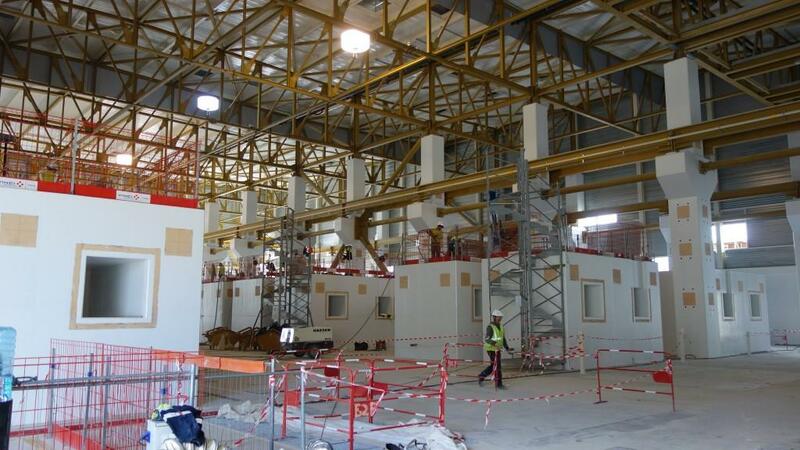 The ITER cryoplant used to be a vast echoey chamber with 5,400 m² of interior space divided into two areas; now, it is filled from floor to ceiling with industrial equipment. 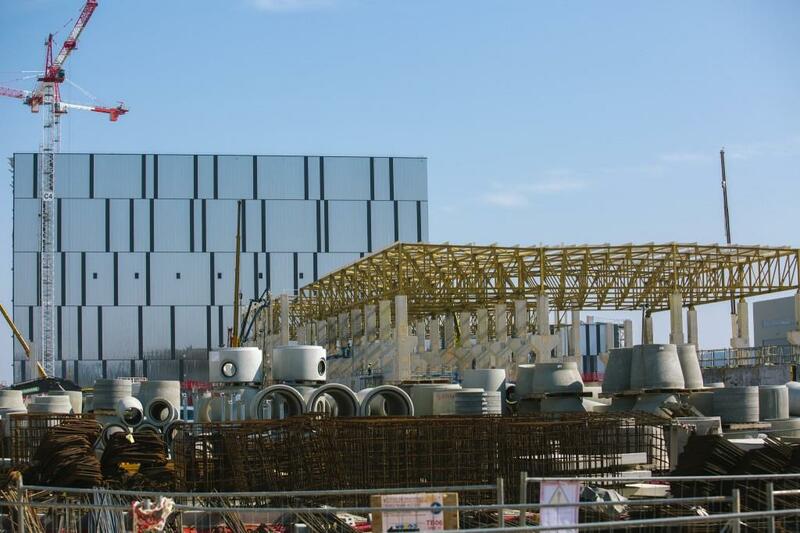 Most of the planned components are now installed in the Compressor Building, drastically reducing the space for circulation. 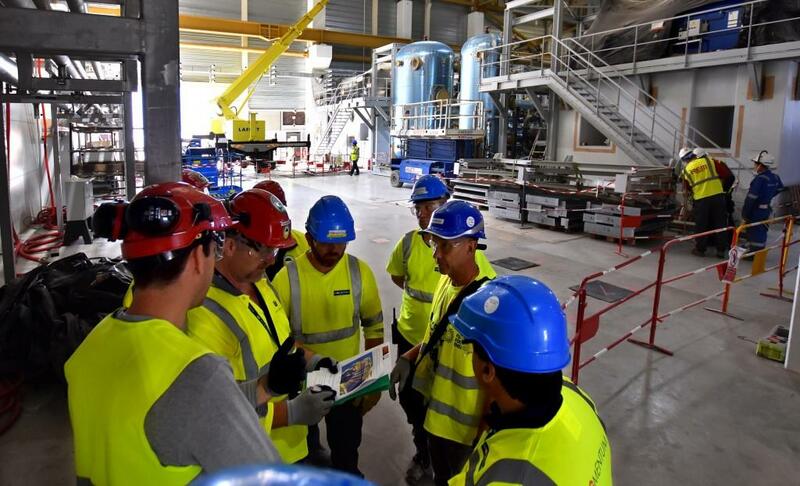 Three parties are sharing responsibility for the plant's procurement: the ITER Organization, responsible for the liquid helium plants; Europe, in charge of the liquid nitrogen plant and auxiliary systems as well as the construction of the cryoplant infrastructure on site; and India, whose contractors are procuring the cryolines and cryodistribution components. 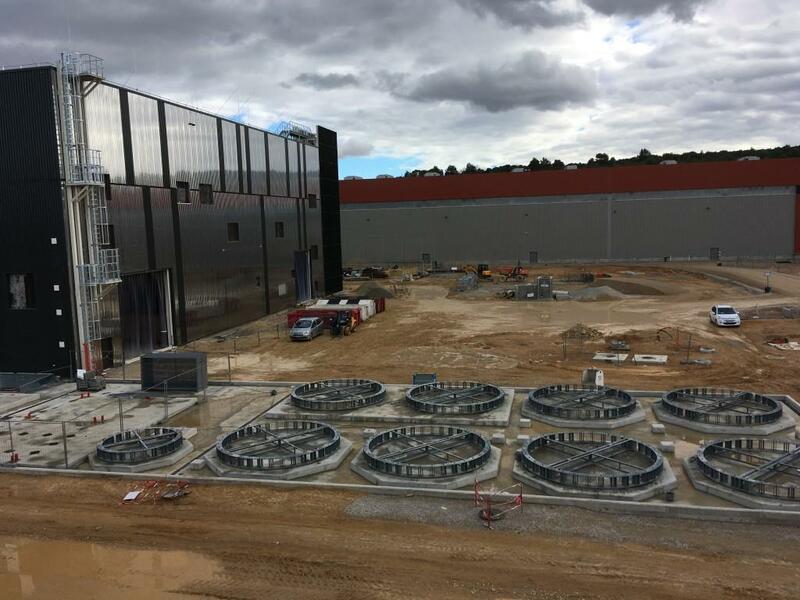 Two 35-metre quench tanks have been removed from temporary storage and transferred to their exterior bays near the cryoplant. 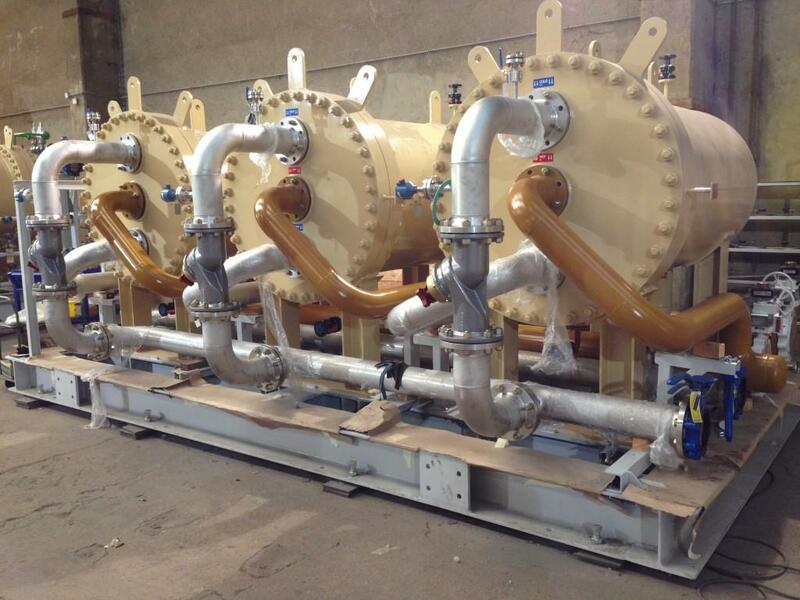 They are designed to hold helium from the magnet system in the case of sudden loss of superconductivity (quench). 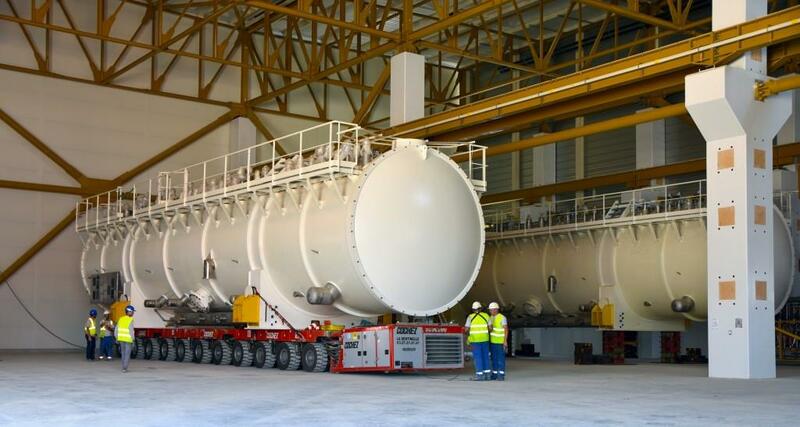 This quench tank travels from its storage area to the cryoplant on a self-propelled modular transporter with 18 independently manoeuvrable axles. 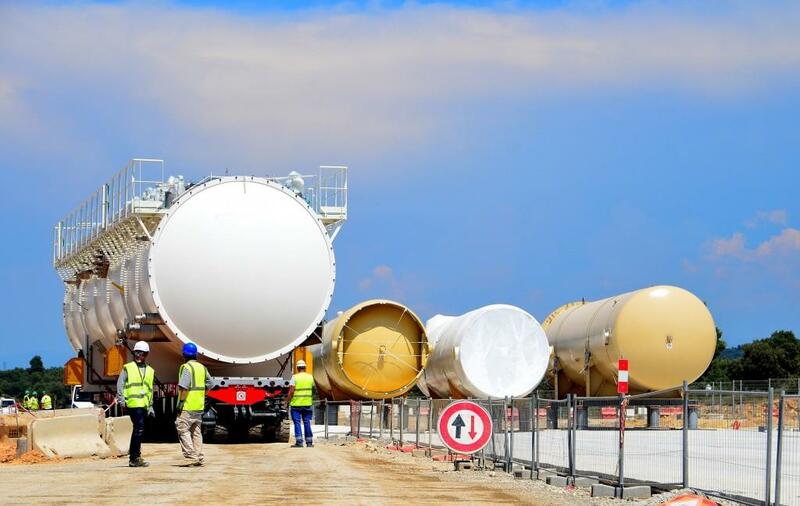 Installed vertically because of space constraints, six identical tanks will store 380 cubic metres of gaseous helium each at a pressure of 22 bars. 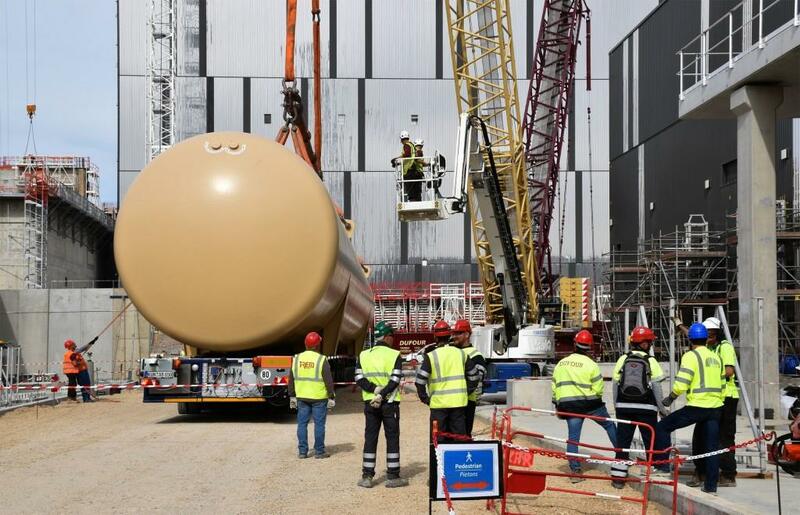 Seized at both ends by cranes working in tandem, the 20-metre high, 150-tonne steel tank is slowly transitioning to its final position. 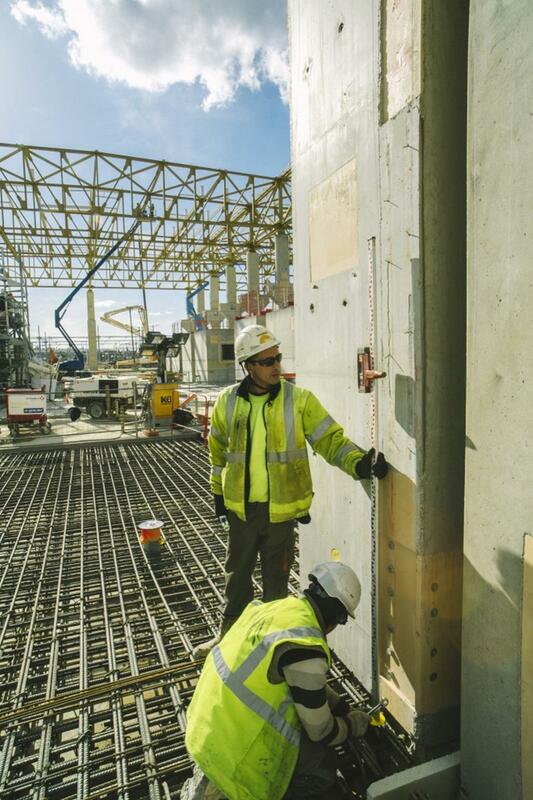 It takes three men, weighing in with all their strength, to precisely align the openings in the tank's lower rim with the 36 rods anchored deep in the concrete. 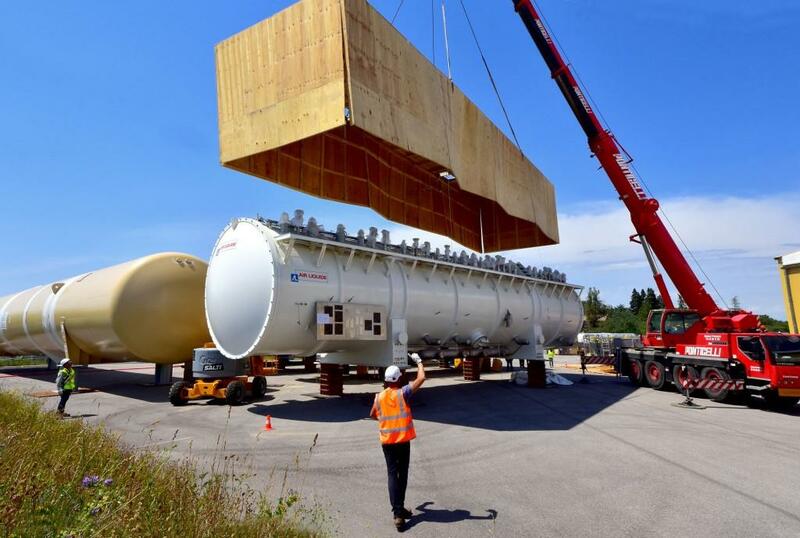 Less than one hour after the beginning of the lifting operation, the tank is in place. 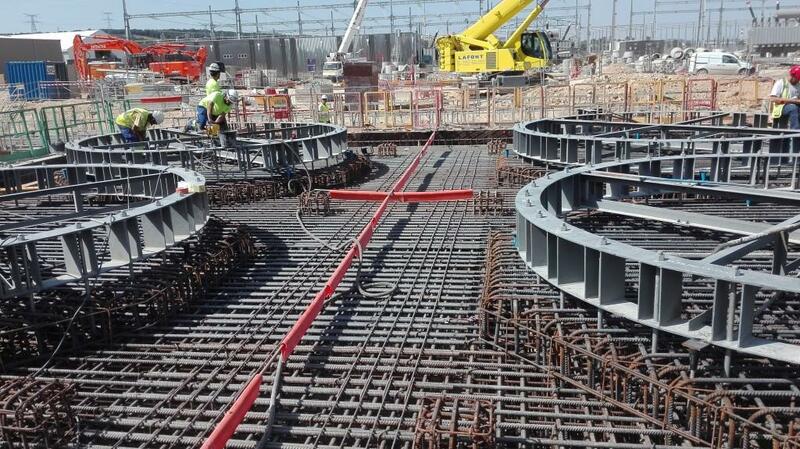 Each rod has passed through its corresponding hole in the lower rim and is ready to be bolted. 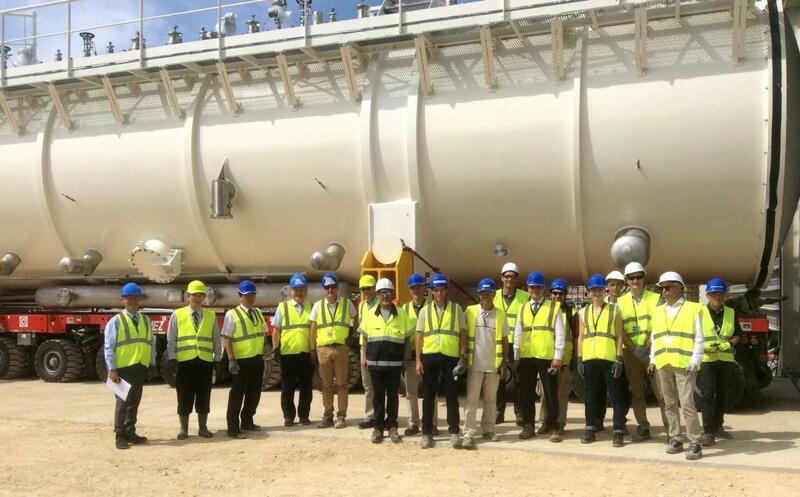 Representatives of the ITER Organization, the European Domestic Agency and of all the contractors involved in the operation (Air Liquide, Dufour, Technilevage, Altead, SETIS and IREM) pose in front of the massive component, now bolted to its concrete platform. 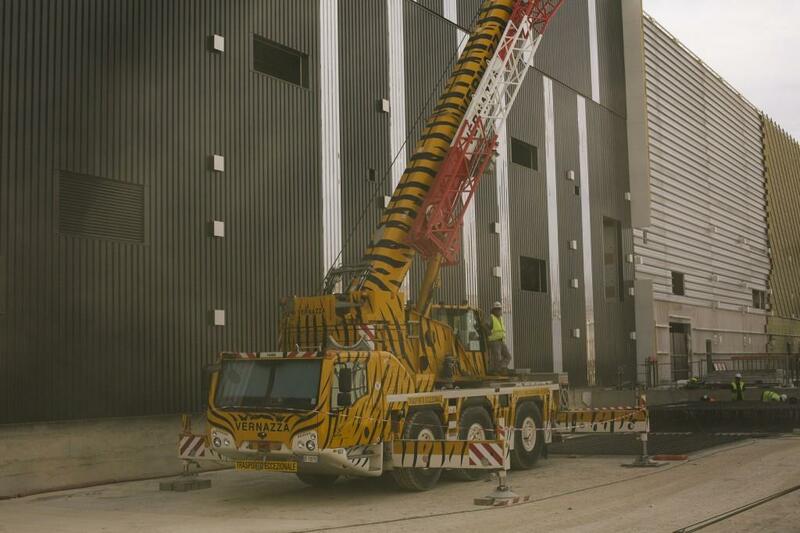 This large crawler crane was erected last week near the cryoplant. 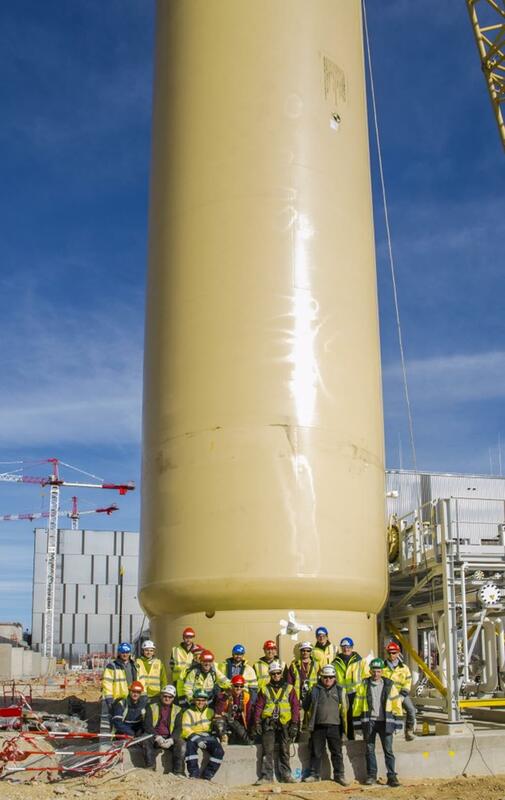 Beginning on 14 February, it will be used to lift vertical tanks for the storage of liquid and gaseous helium and nitrogen into position. 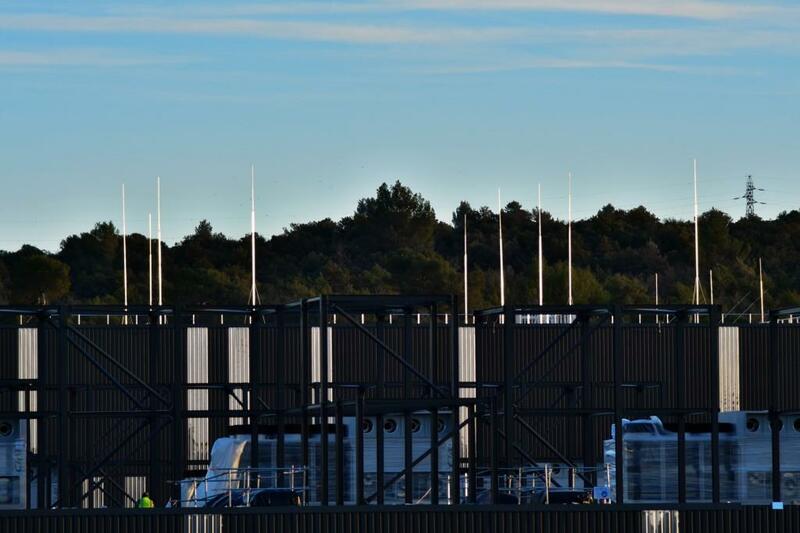 A large number of lightening rods have been installed on the roof of the cryoplant. 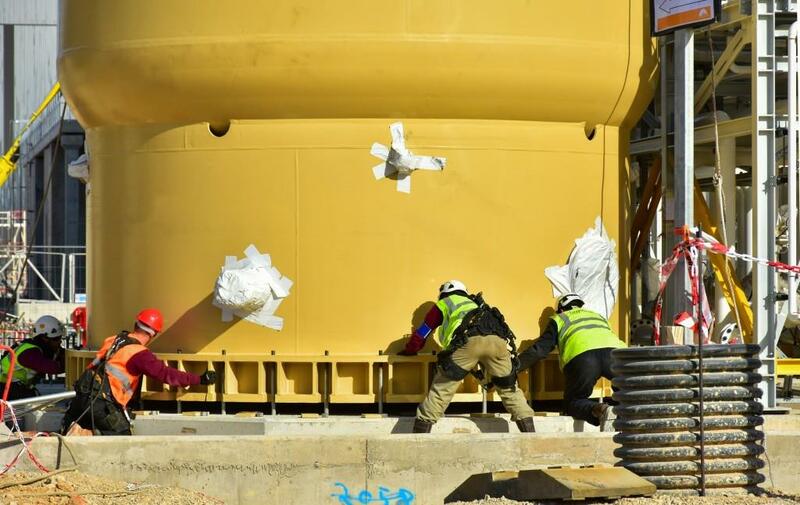 Beginning in February, teams will begin installing the exterior storage tanks for helium and nitrogen. 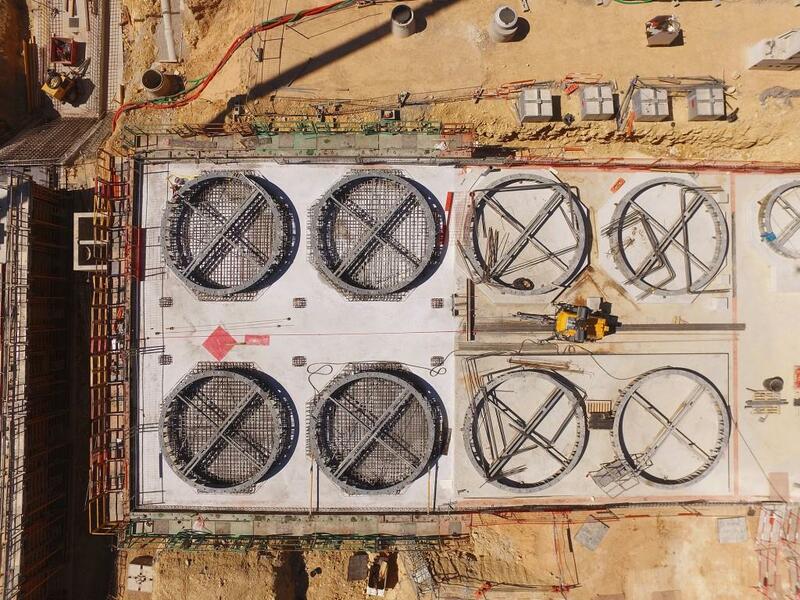 In the zone pictured, the tanks will be installed vertically. 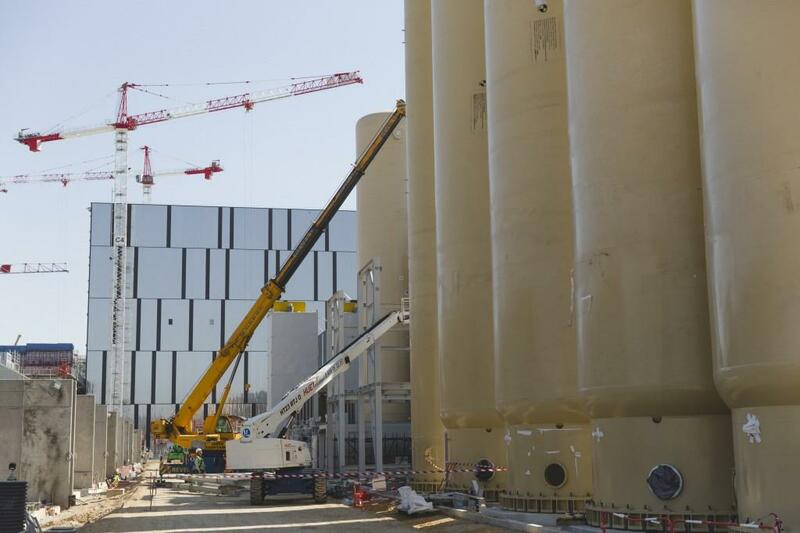 To install the tanks, a tall crane will be needed. 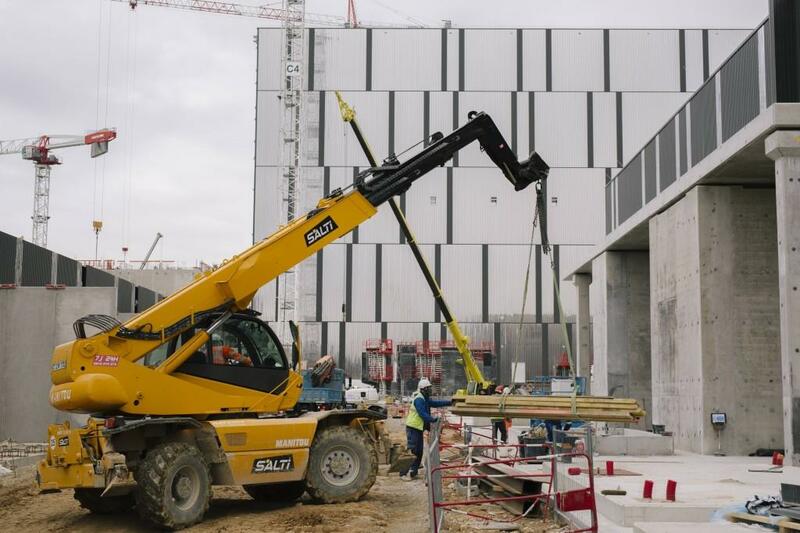 Early February, 40 trucks will deliver the crane components. 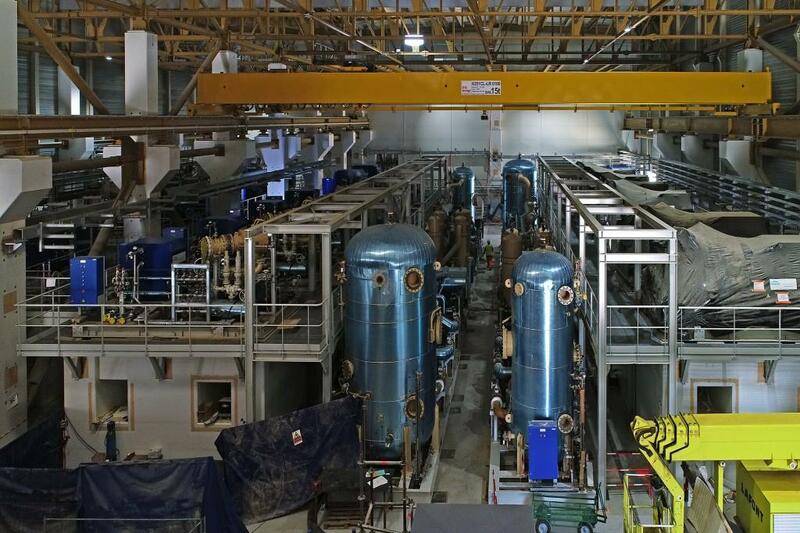 All 18 helium compressor skids have been positioned on their concrete platforms in the cryoplant's Compressor Building. 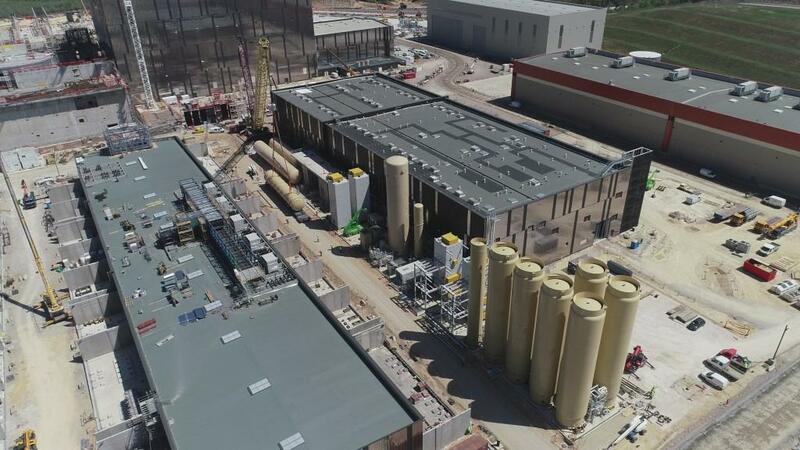 The cryoplant (adjacent to the red-topped building) is all closed up. 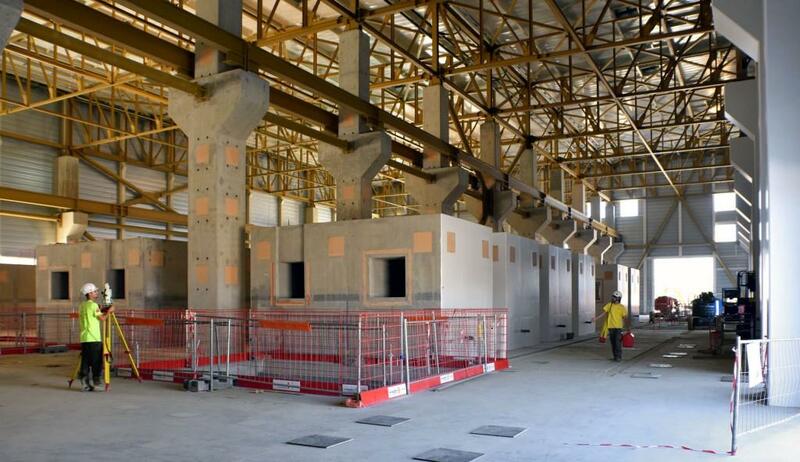 An interior fire wall separates the building into two spaces. 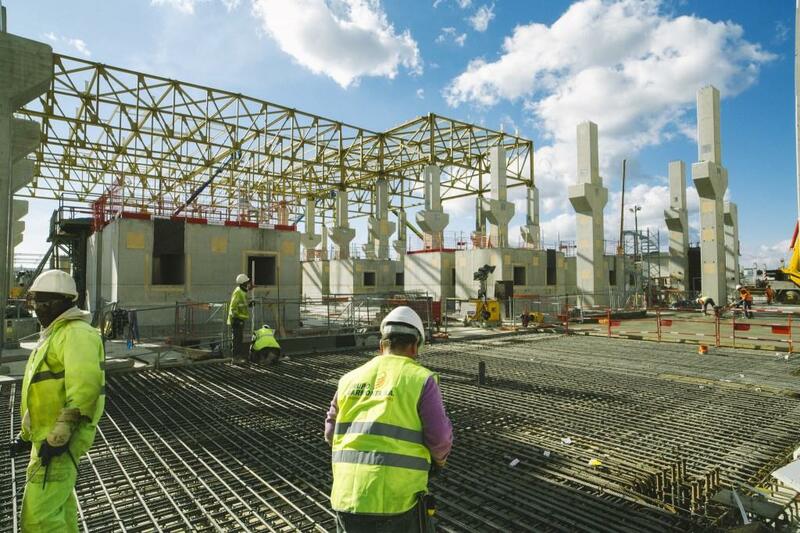 Work is underway on the exterior area for gas storage. 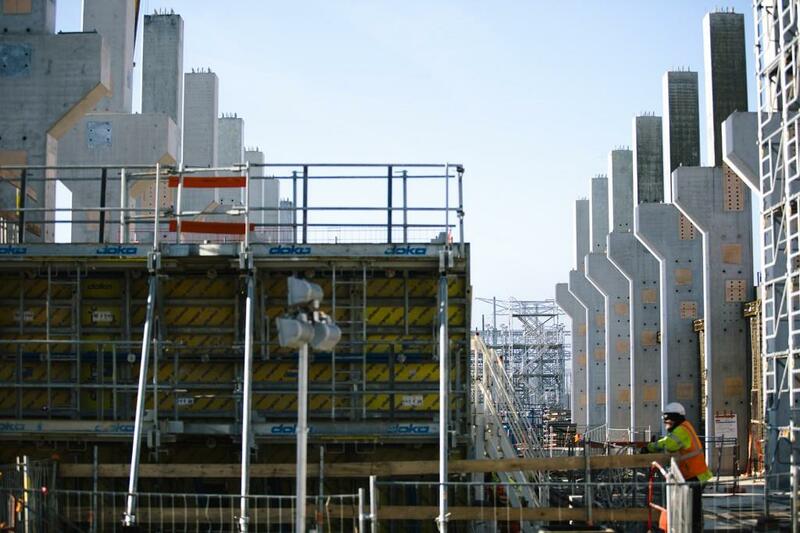 Multiple layers of exterior cladding ensure the cleanest possible interior environment for the cryoplant. 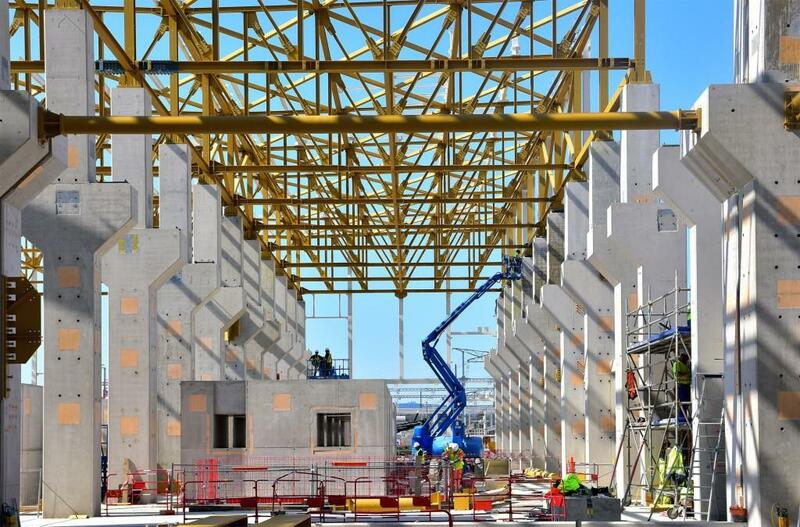 The last layer ties the cryoplant into the "look and feel" of the main ITER buildings. 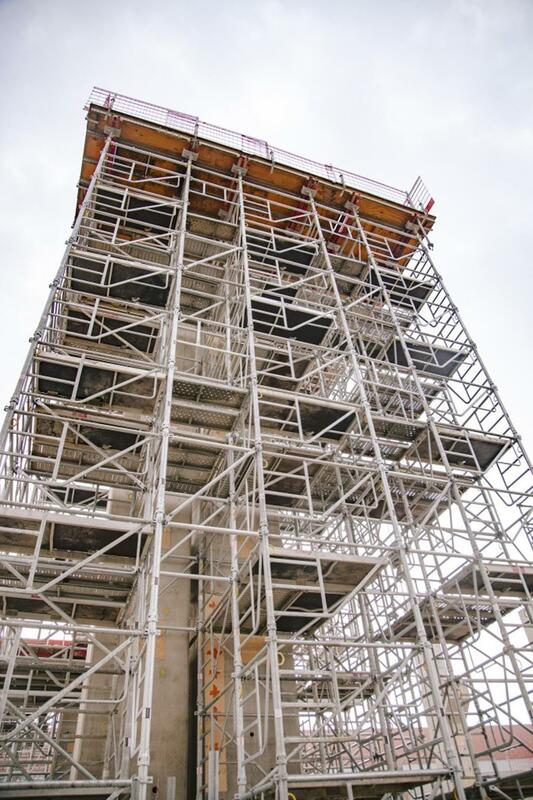 Work is underway in September on the helium screw compressor skids platforms. 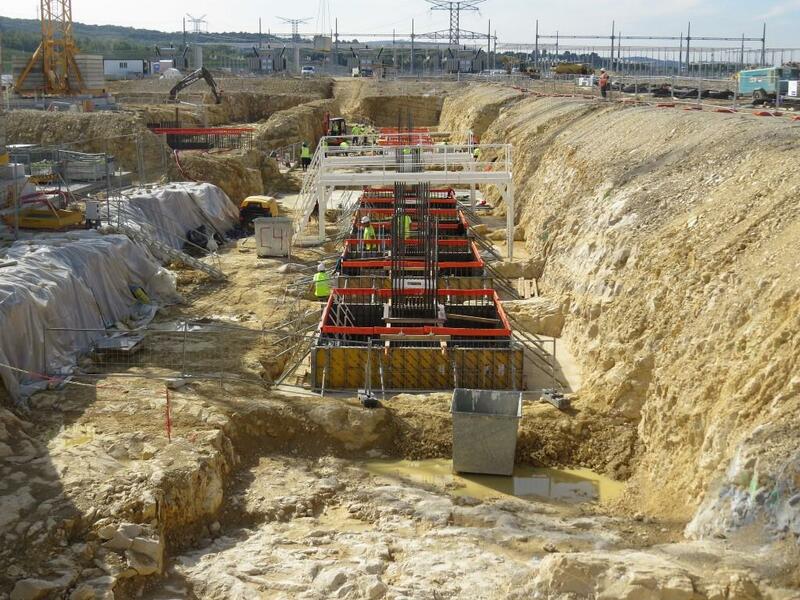 Anchor structures for the vertical storage tanks are set in place before concrete pouring begins. 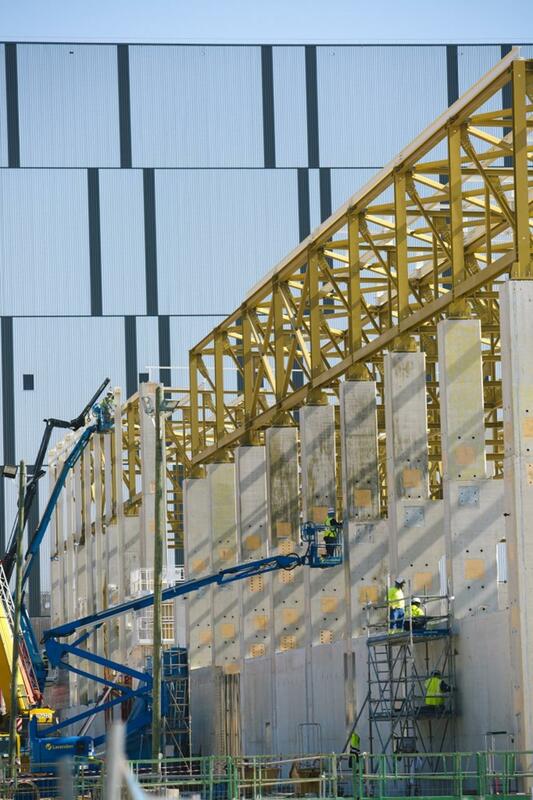 Workers have started to install the final reflective layer of cladding on the eastern face of the cryoplant. 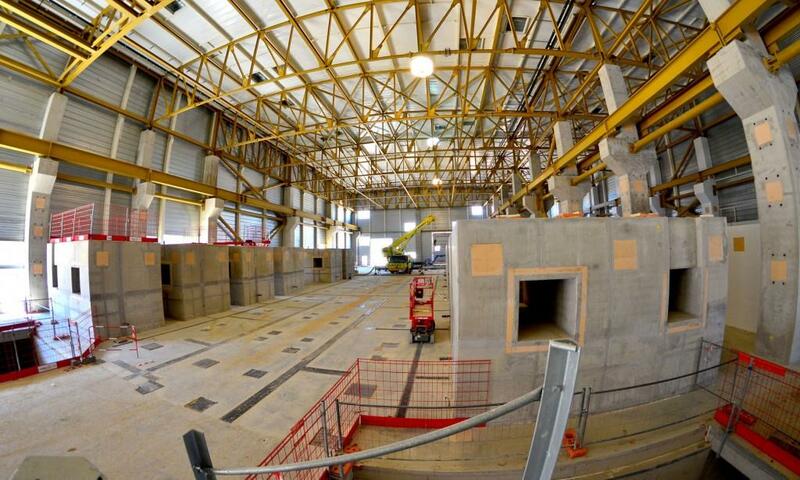 Work underway in the cryoplant to prepare for the arrival of 18 helium screw compressor skids. 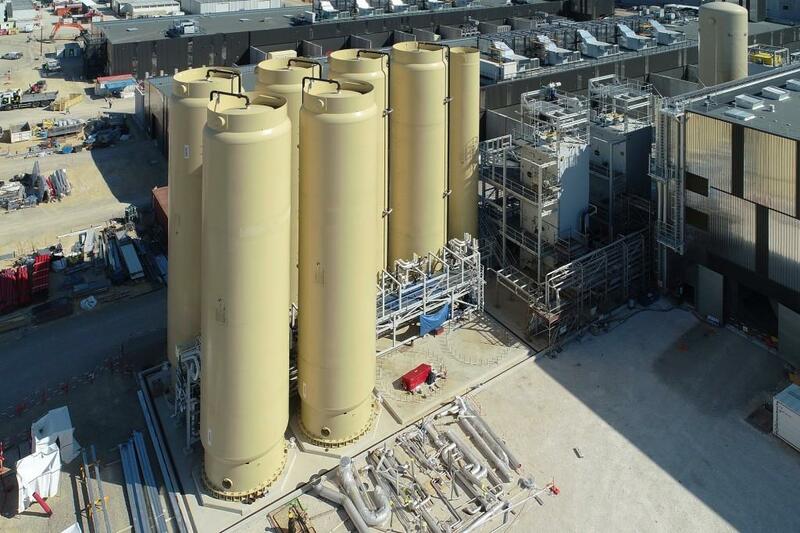 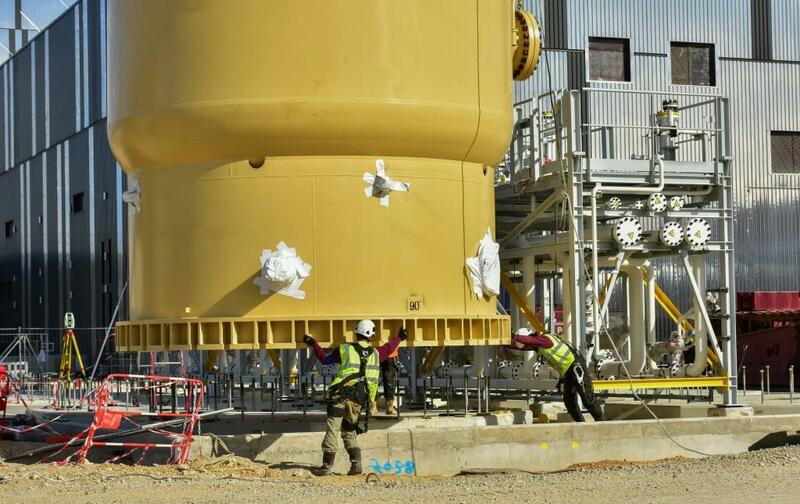 Each one of the 25-tonne units will be installed on top of its own four-metre-high concrete pad, allowing oil from the compressor to regain the oil separation system through gravity. 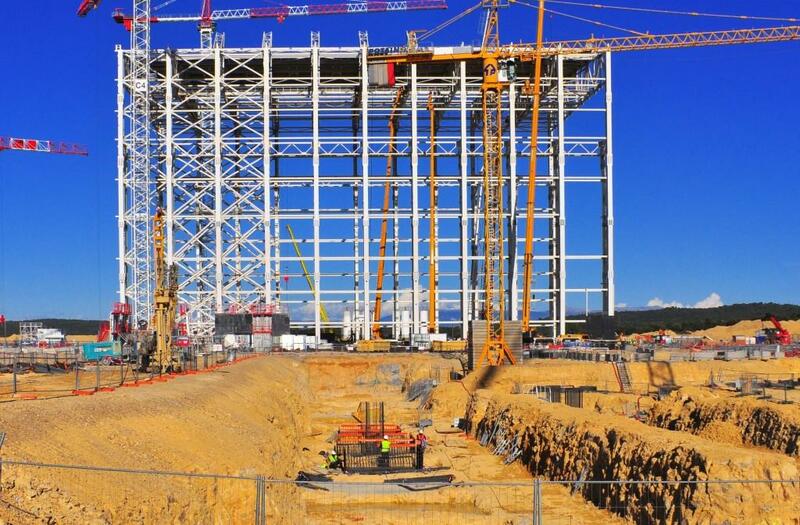 The 18 concrete structures in the ITER Compressor Building are massive pads that will each support one 25-tonne helium compressor skid. 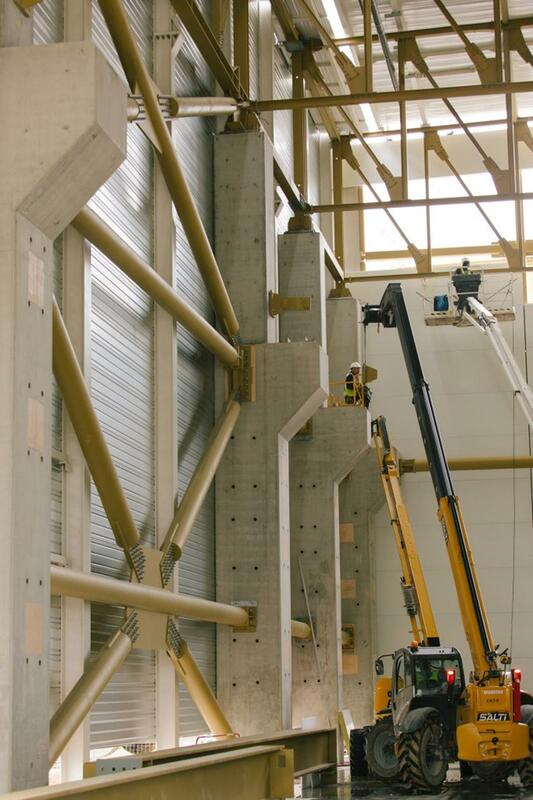 What appears as "windows" in the concrete blocks are in fact passages for the dense interconnecting piping. 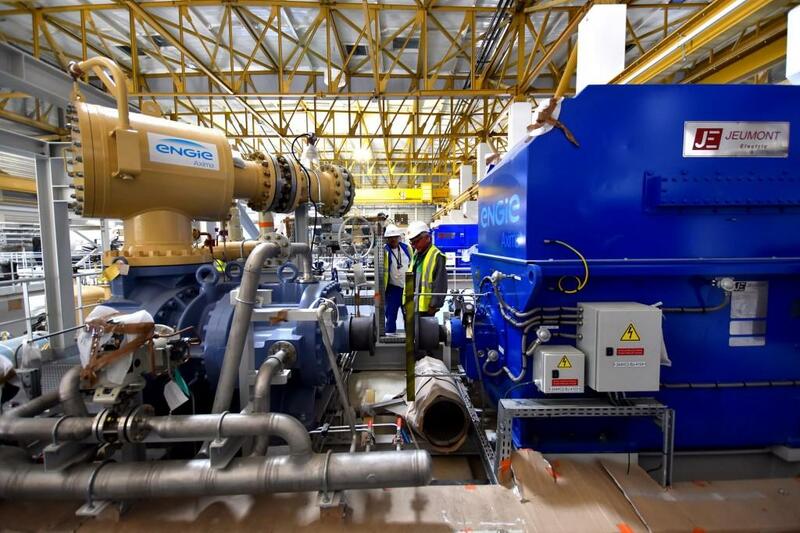 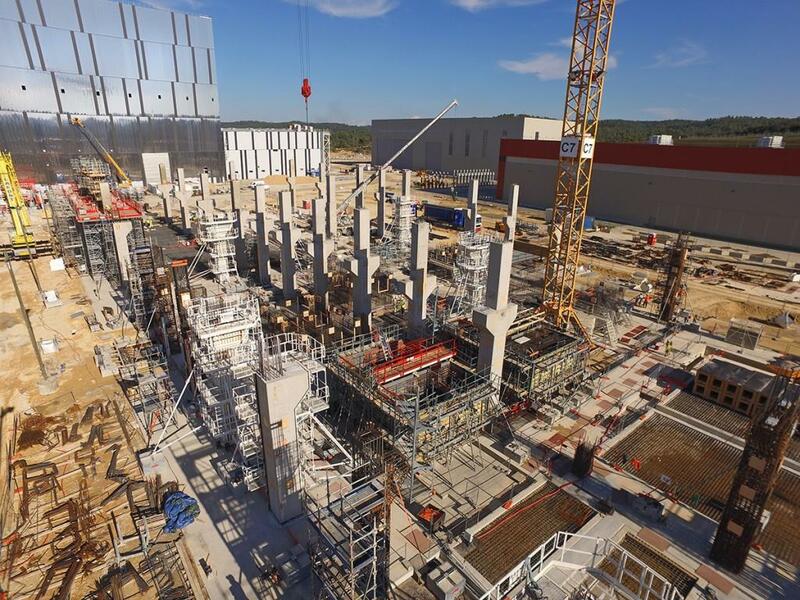 In the 3,400 m² available in the Compressor Building, contractors will install 18 oil-flooded screw compressors for the helium plant as well as other helium compressors and compressors for the liquid nitrogen plant. 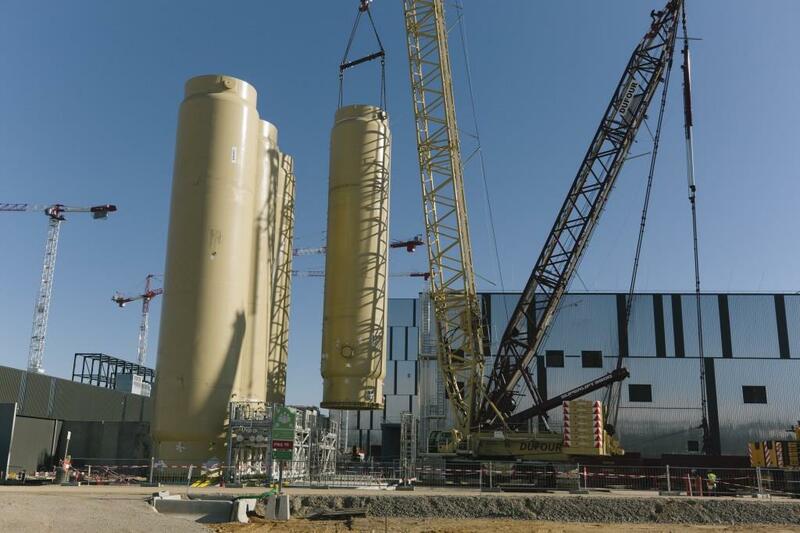 One of the three helium cold boxes is transported through the open door of the on-site cryoplant. 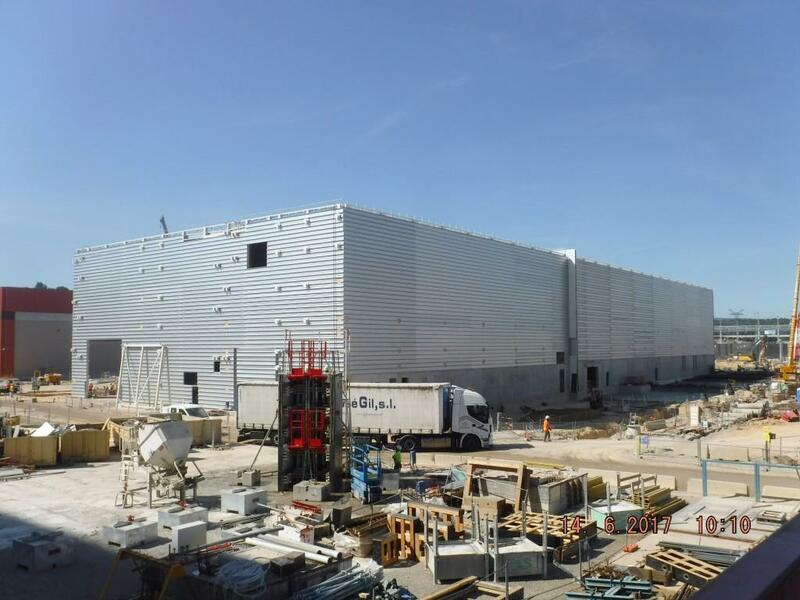 The multi-wheeled transporter positions the second cold box next to the first. 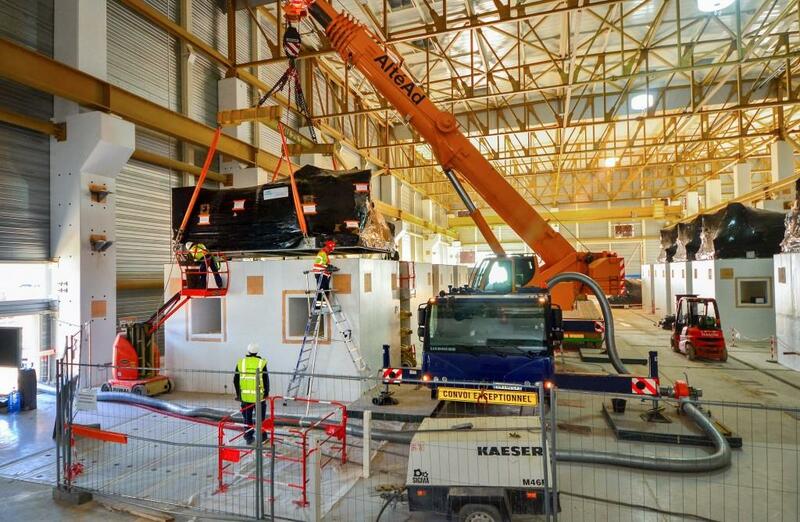 The equipment will now be propped up and the trailer removed. 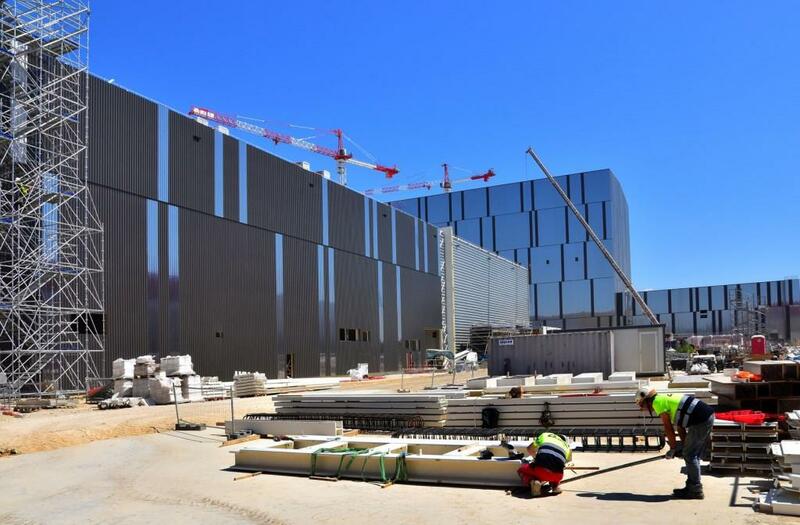 On 20 June three helium coldboxes were moved from storage at the entrance of the ÏTER site to the Cold Box Building of the ITER cryoplant. 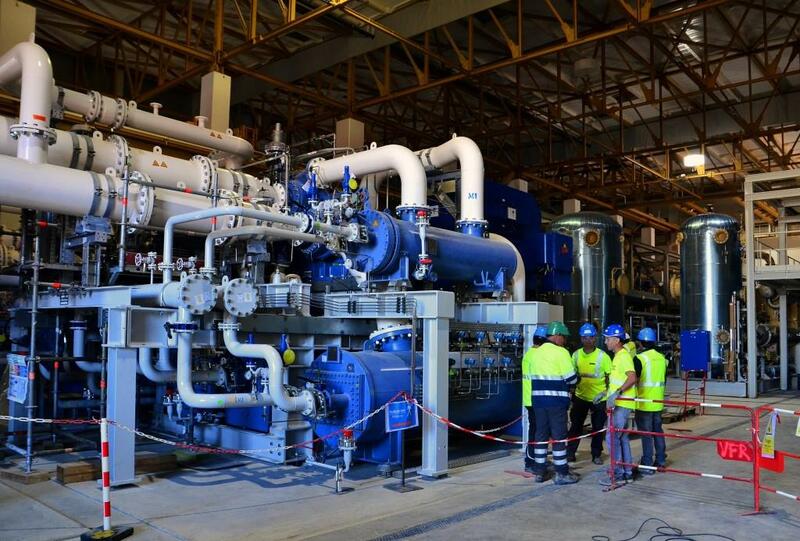 This is the first equipment to be installed ... but certainly not the last! 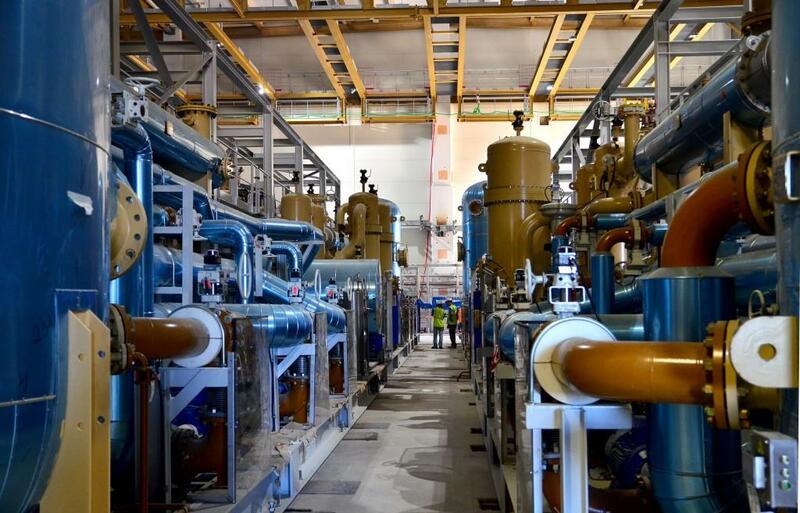 Mid-June, the three helium cold boxes in storage were uncovered and prepared for transport to the cryoplant, where they will be installed. 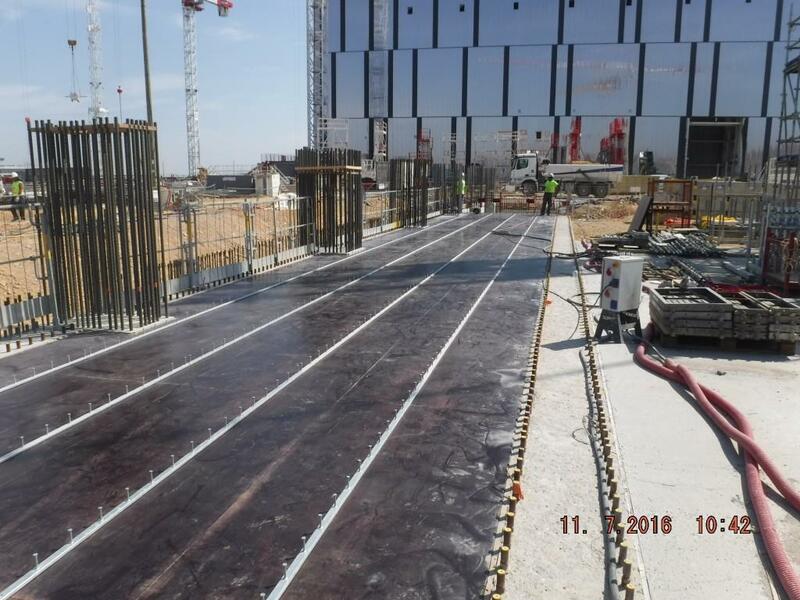 The building's cladding is nearly finalized and work is underway to pour the ground slab for the exterior storage area (foreground). 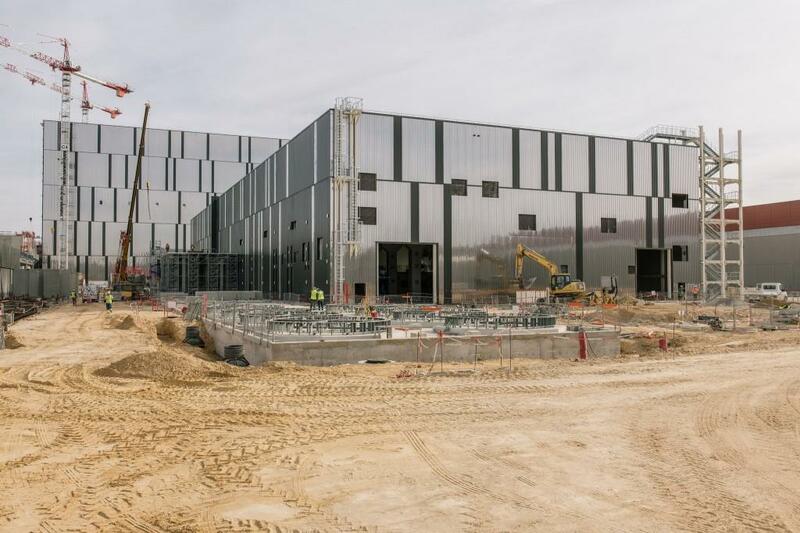 Later this month, the three helium cold boxes will be transferred from storage for installation inside of the building. 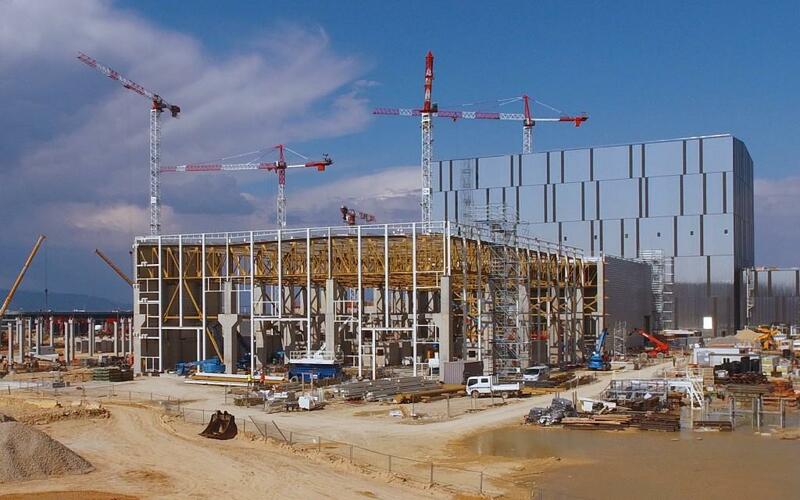 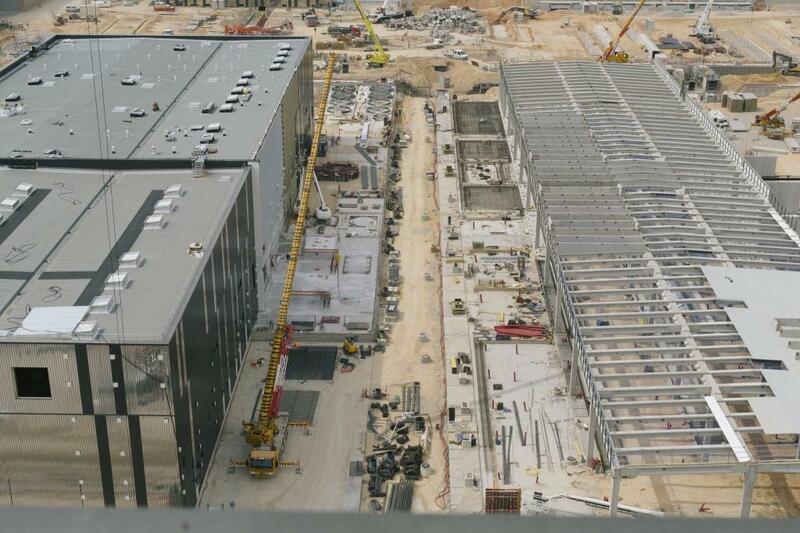 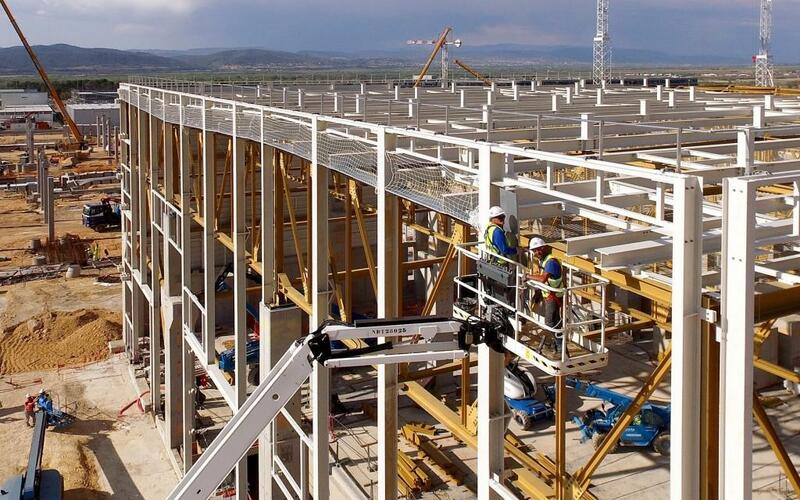 Work is progressing on the ITER cryoplant building. 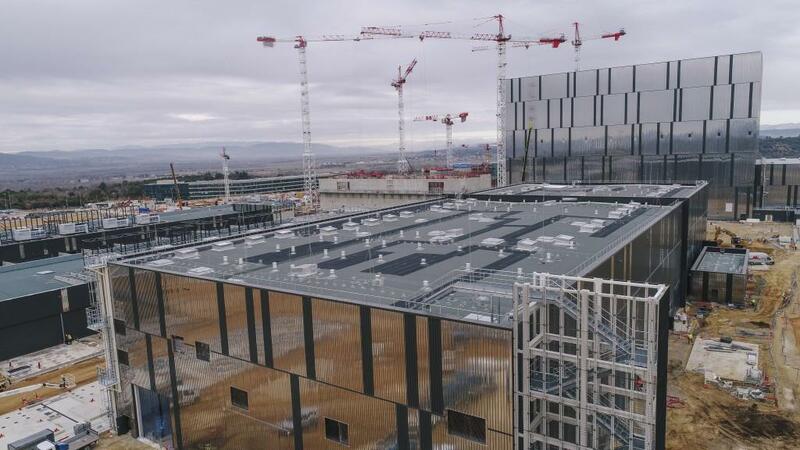 Early access for the first component installation activities is expected in June, with the full building completed in September. 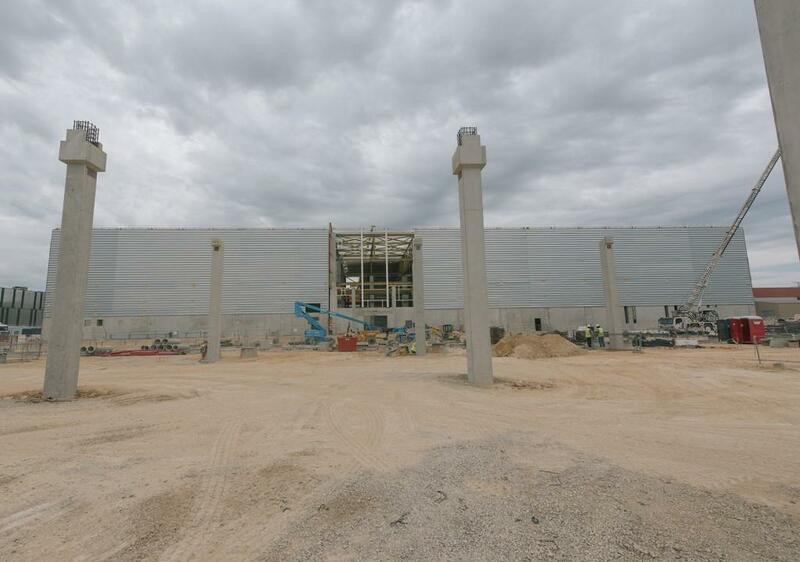 From the exterior it will look like one building, but in fact a thick firewall will separate the Cold Box Building (helium plant) from the Compressor Building (helium and nitrogen compressors). 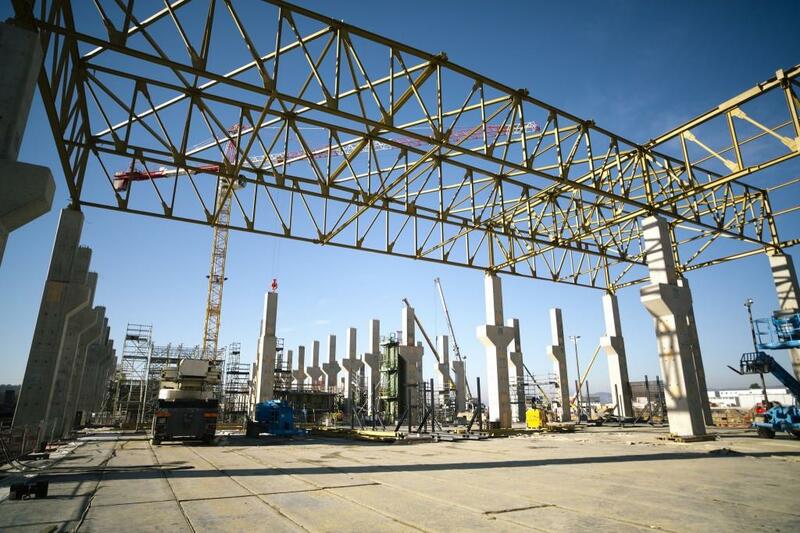 A break in the roof structure marks where the firewall will be erected. 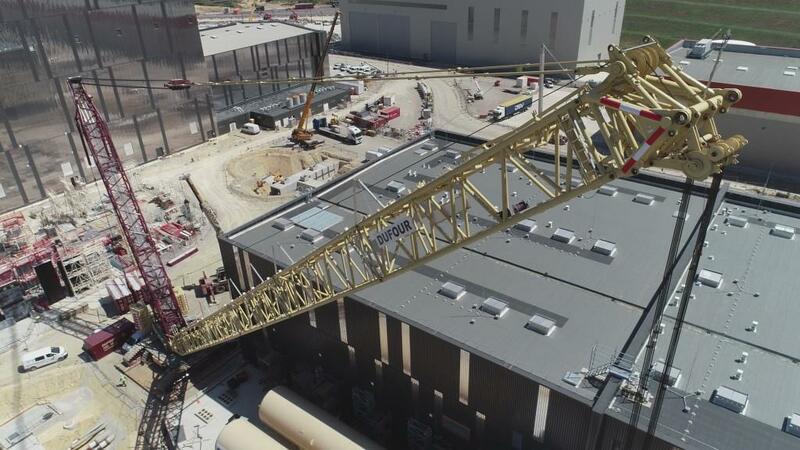 Seen from one of the worksite cranes, the cryoplant is taking shape. 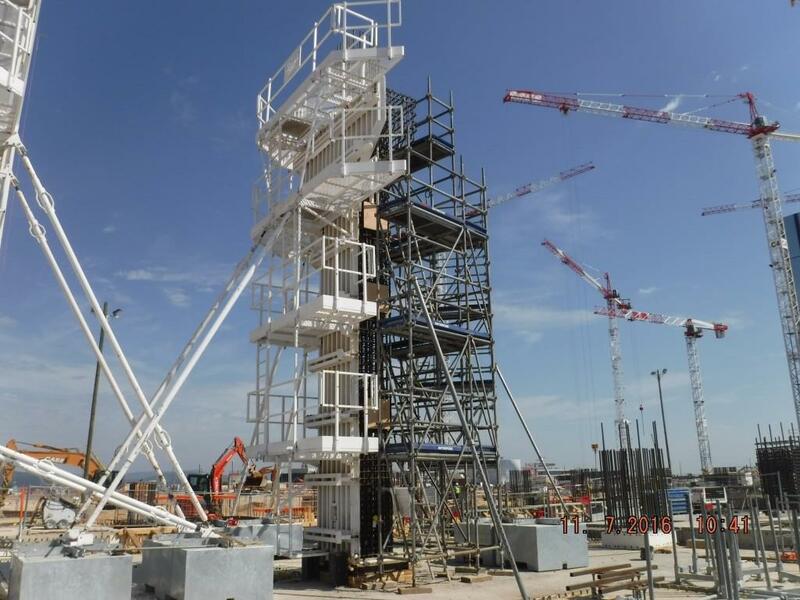 In late June, the first components will be installed. 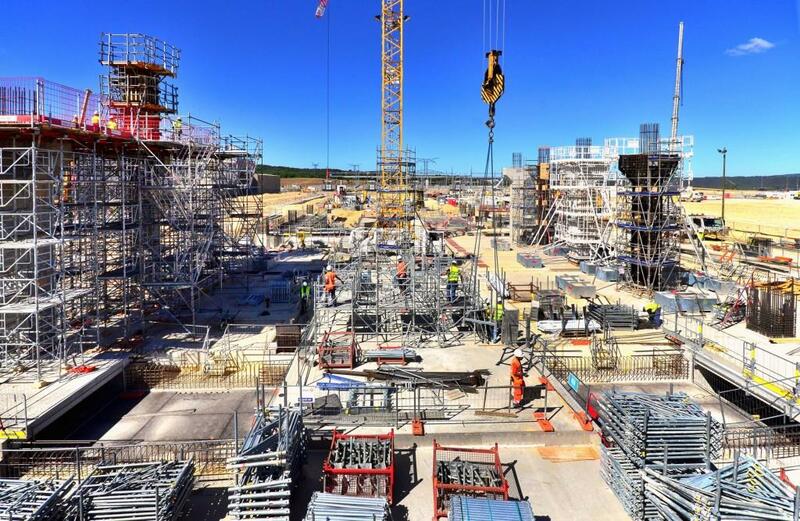 At the entrance to the ITER site, five large elements of the cryoplant are temporarily stored—three coldboxes for the liquid helium plant (in white, procured by the ITER Organization) and two large quench tanks procured by Europe that will store helium in the event of a magnet quench. 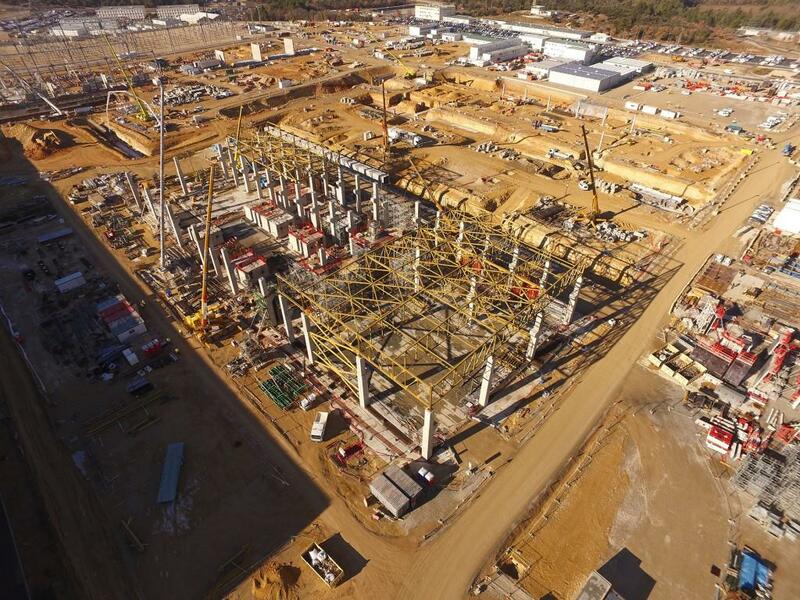 End-of-day light on the cryoplant worksite, where teams are working overtime to ready at least part of the facility for component installation activities to begin in the second quarter of 2017. 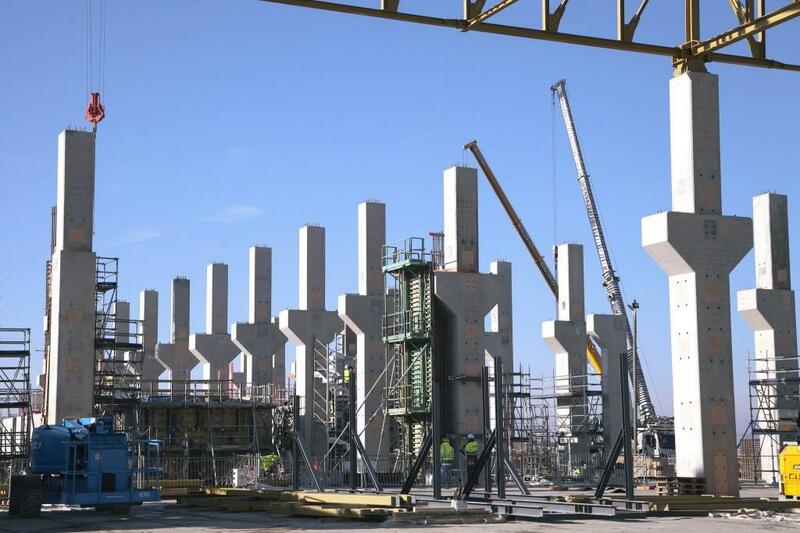 These massive columns will support the structure of the Cryoplant Building. 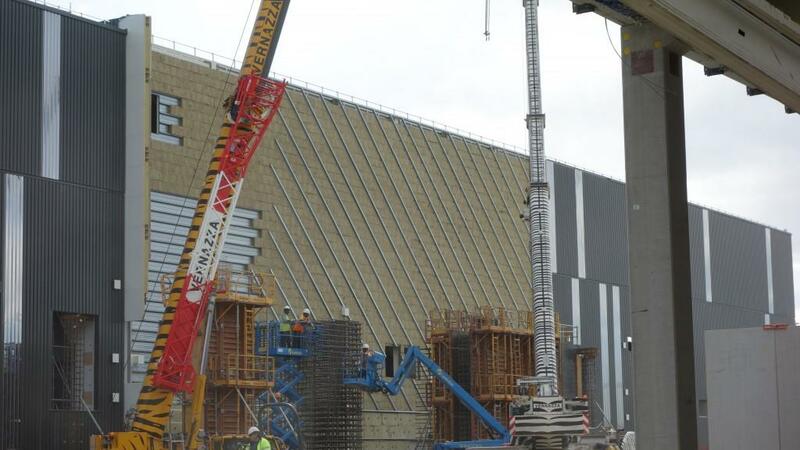 The worker in orange (on the scaffolding) gives an idea of their size. 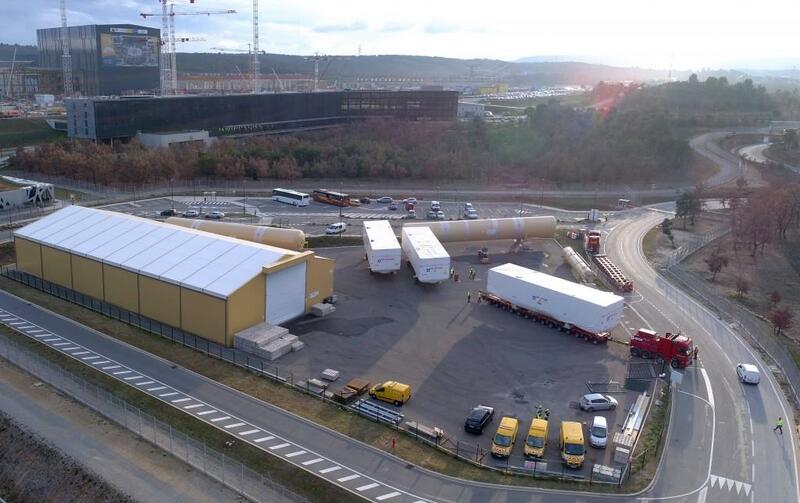 Cold components are arriving now for the ITER cryoplant. 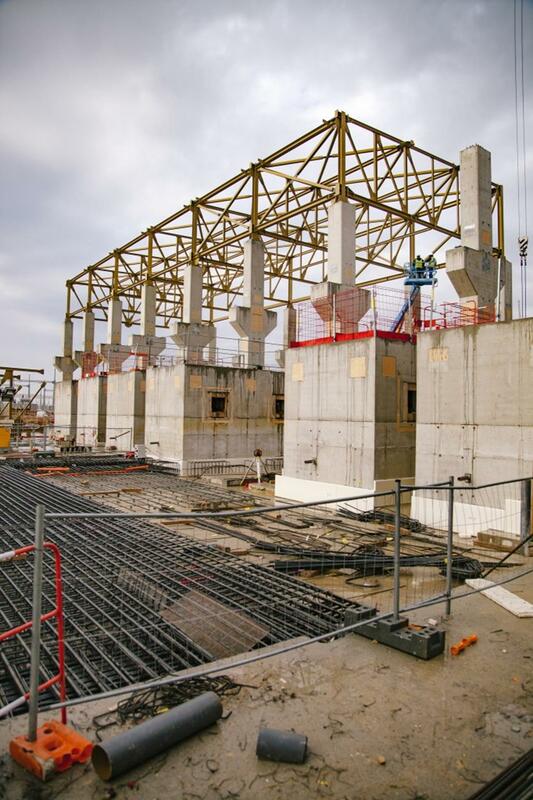 The 5,400 m² building that will house them is under construction on the southeast portion of the platform. 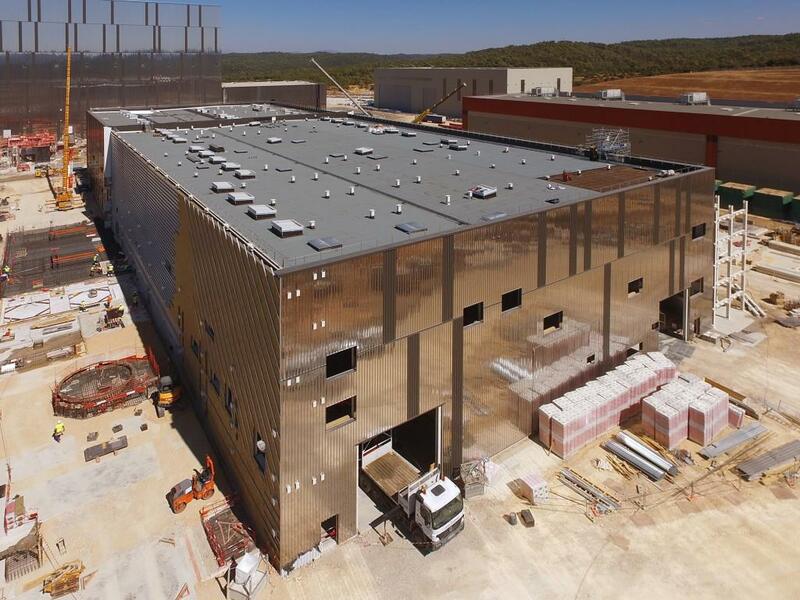 Each 4.2 x 21 metre cold box will weigh about 137 tonnes once all internal components are integrated. 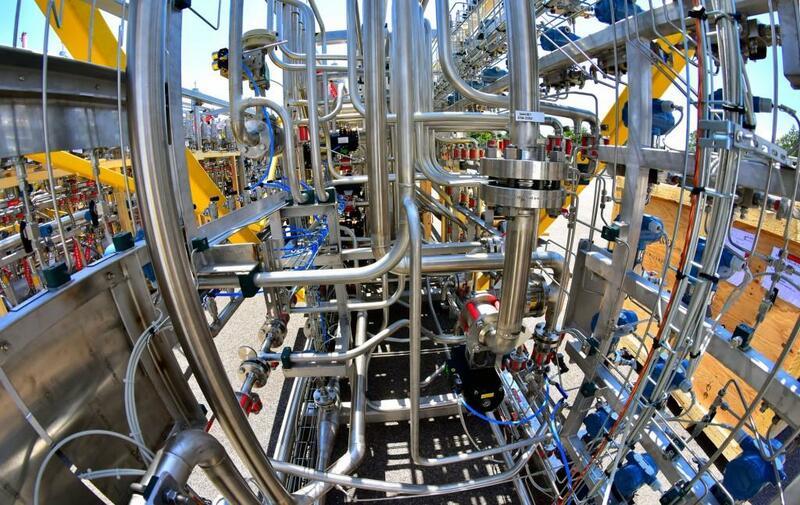 Three identical helium plants will store and circulate liquid helium (at a temperature of 4 K or minus 269 °C) throughout the installation. 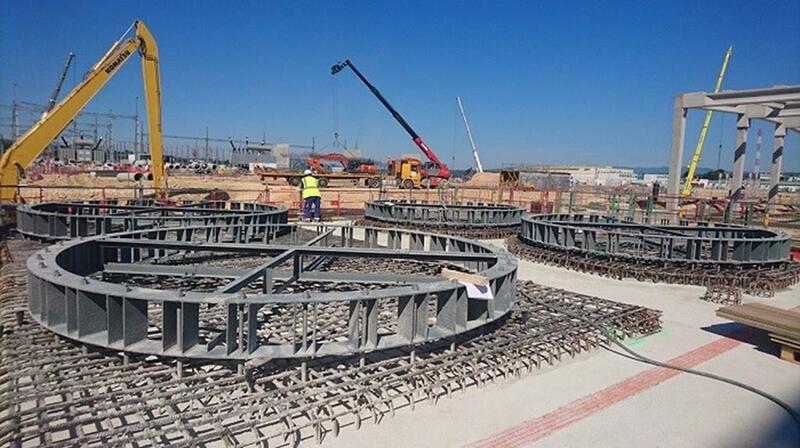 The different components of the ITER cryoplant are expected to arrive at ITER in 450 shipments. 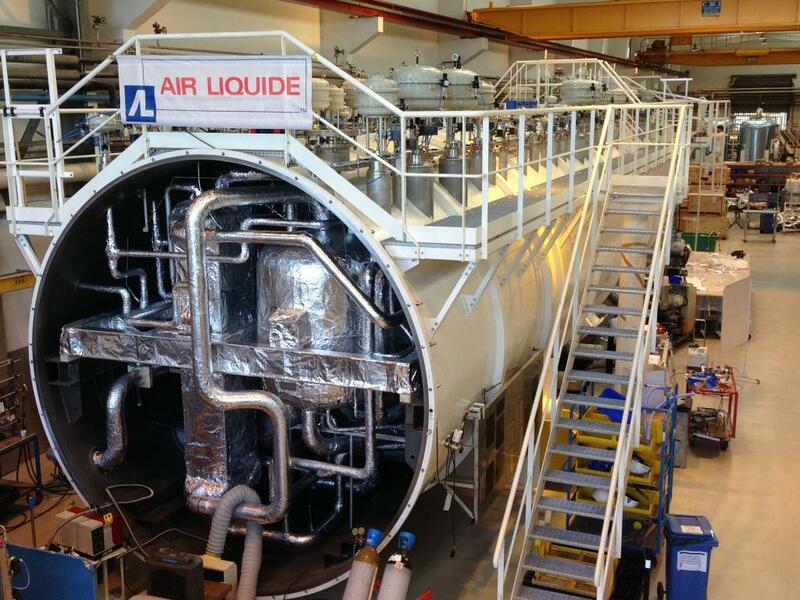 Pictured: the warm panels of the liquid helium cold boxes. 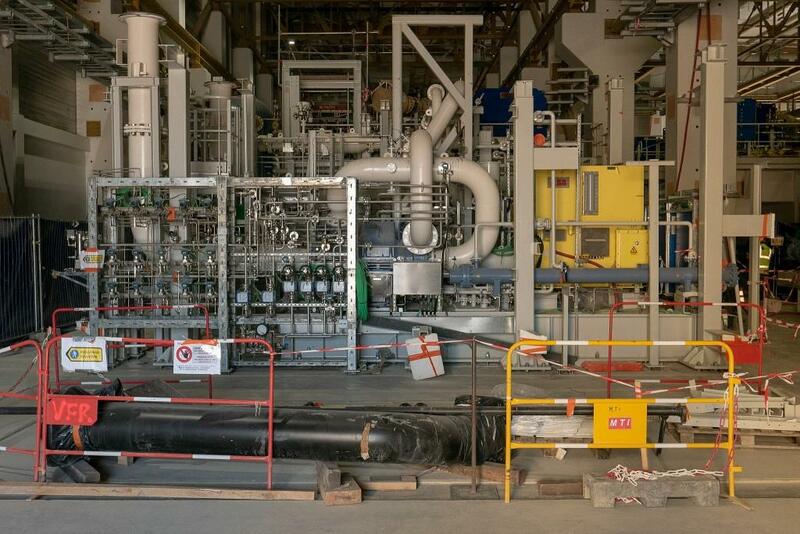 18 compressors will be required for the operation of the helium refrigerators. 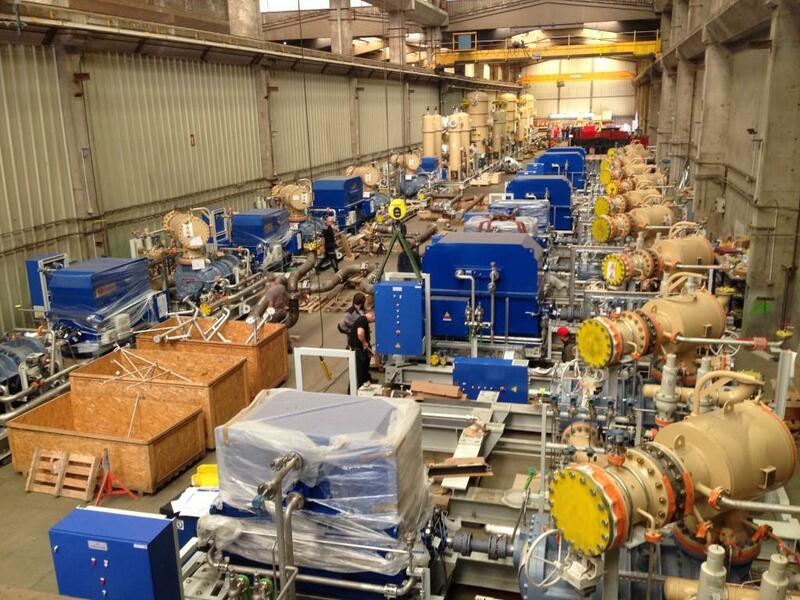 In a factory in the northeast of France, near Metz, compressor parts are being assembled on the shop floor. 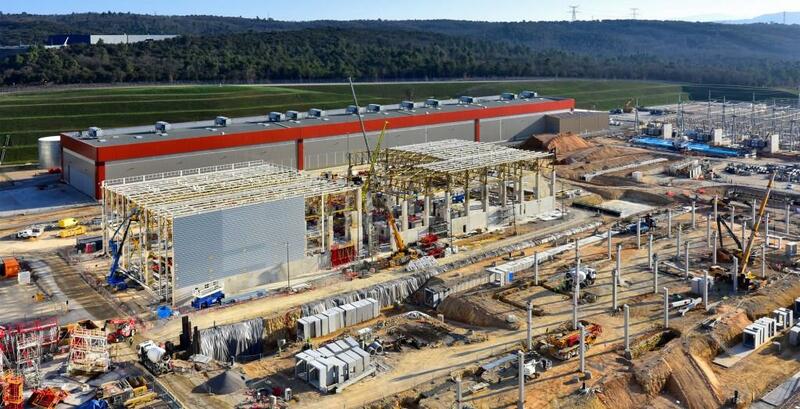 The ITER cryogenic system: 50 cold boxes, 3 kilometres of cryolines, and 4,500 components. 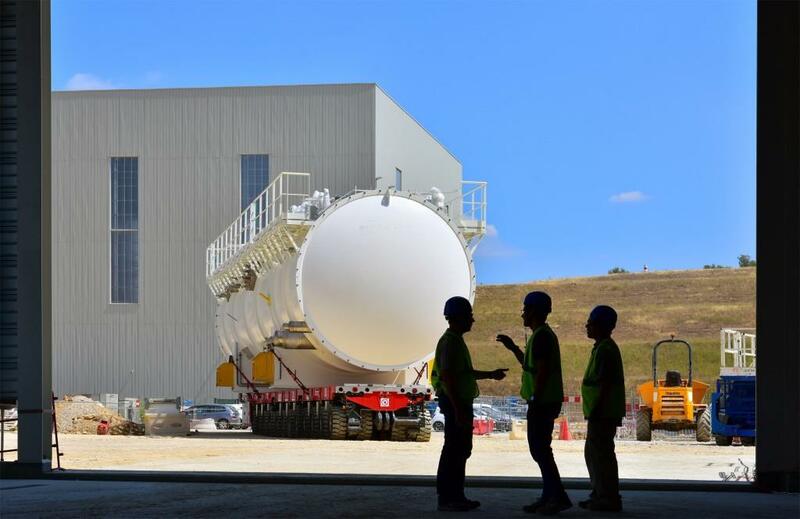 Ninety percent of components were delivered in 2016 (pictured: heat recovery skids for the liquid helium plant). 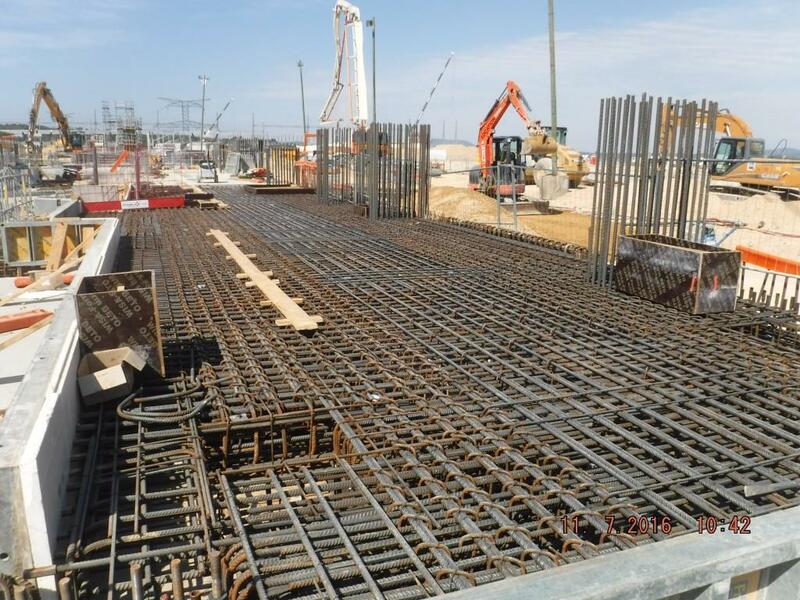 Columns are rising for the ITER cryoplant, now that the underground galleries and the foundations are finished. 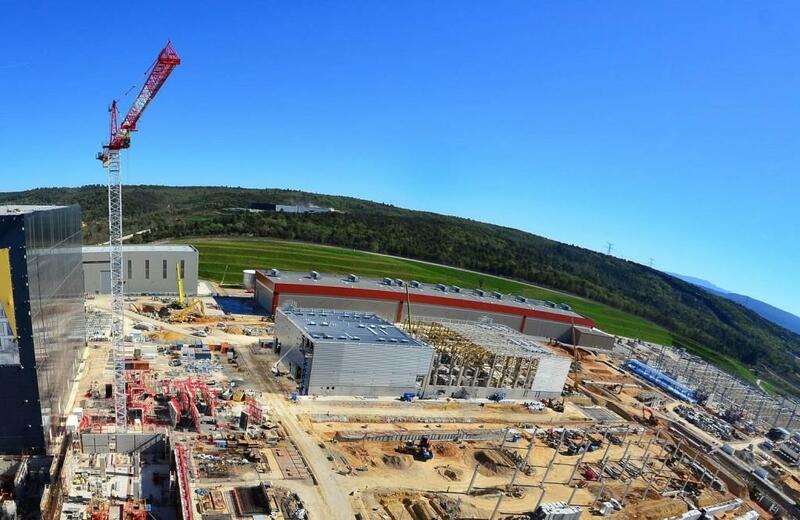 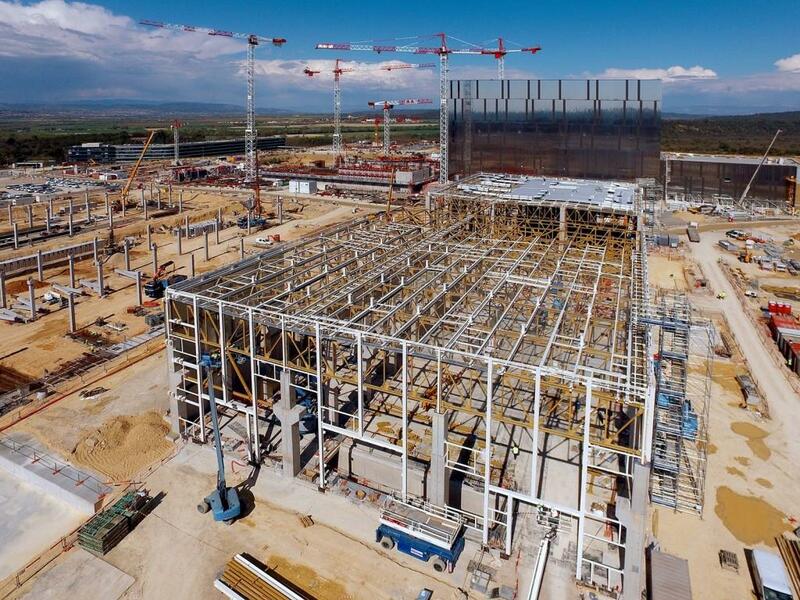 The ITER cryoplant will deliver 75 kW of combined cooling power to the ITER installation. 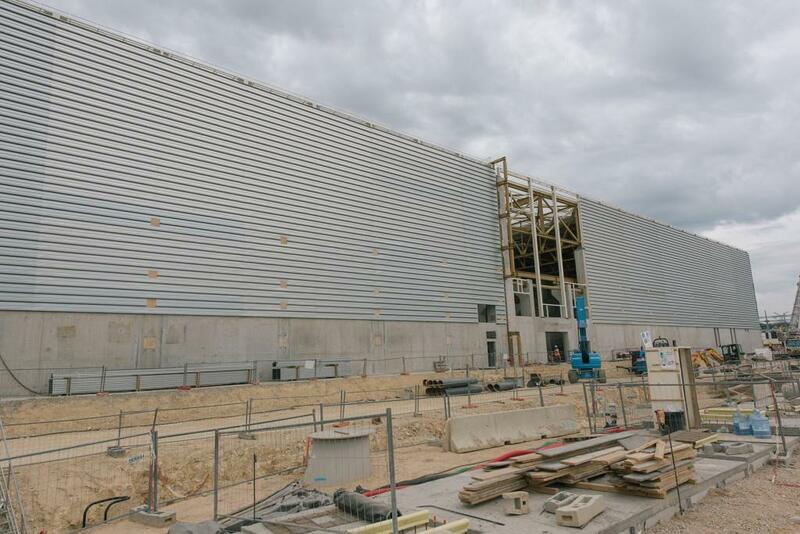 Work is underway now on the building, and before the end of the year most of the equipment will have been delivered to the site. 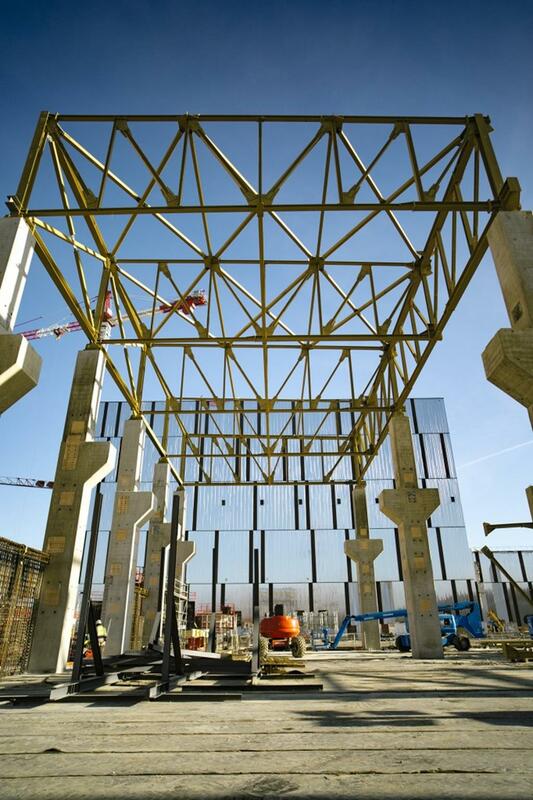 Adjacent to the Assembly Building, work is underway on the ITER cryoplant building. 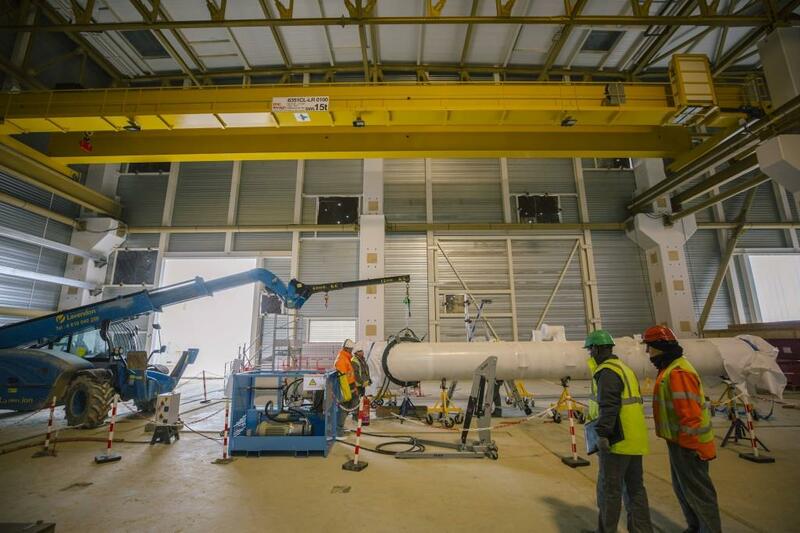 Infrastructure works are underway on the westernmost portion of the cryoplant worksite to support the warm and cold storage tanks that will be capable of storing the entire inventory of helium and liquid nitrogen during maintenance periods. 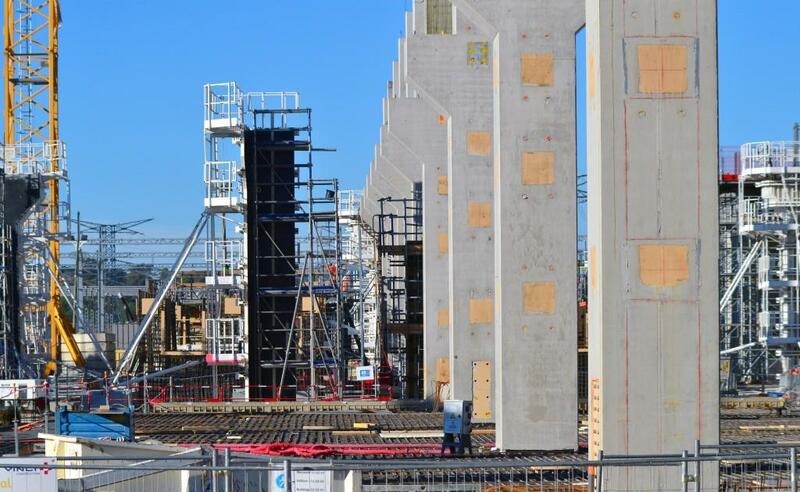 On the completed foundations, pillar frames are starting to rise. 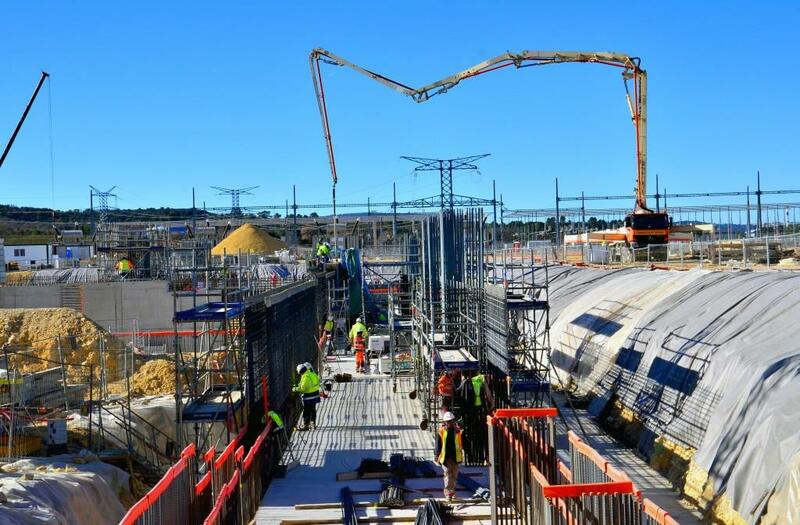 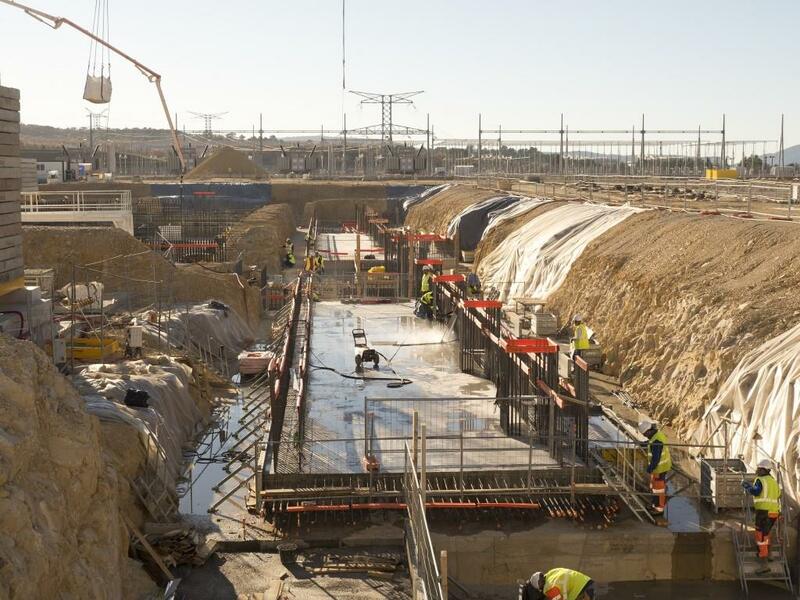 Work on the foundations and underground structures of the ITER cryoplant is coming to an end. 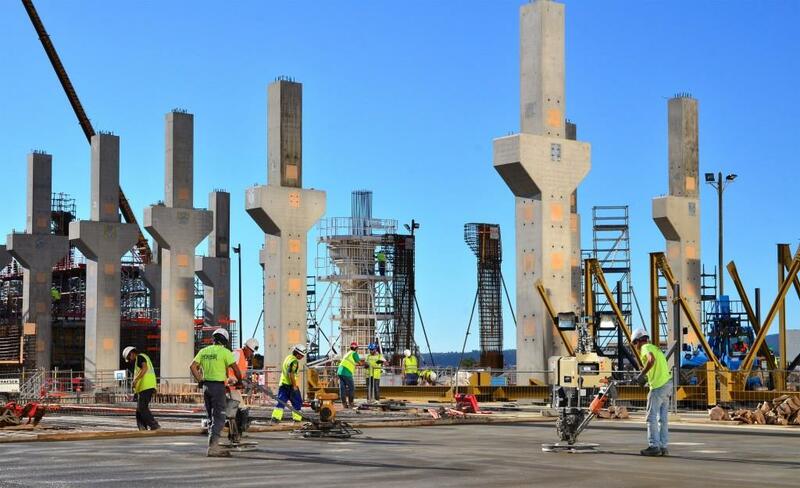 Soon, approximately four dozen 16-metre-high pillars will be erected to support the building's steel structure. 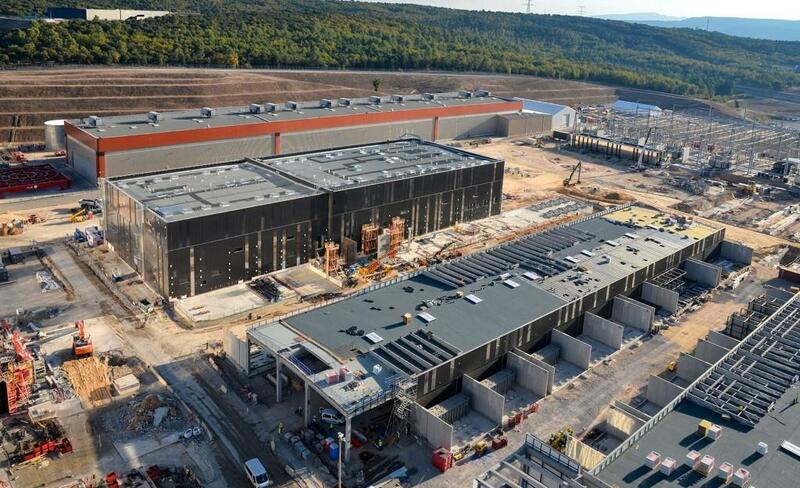 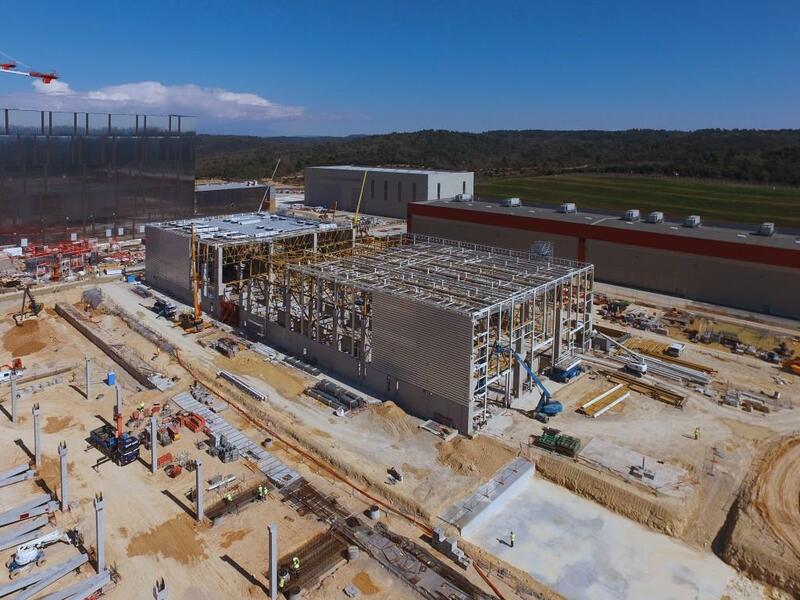 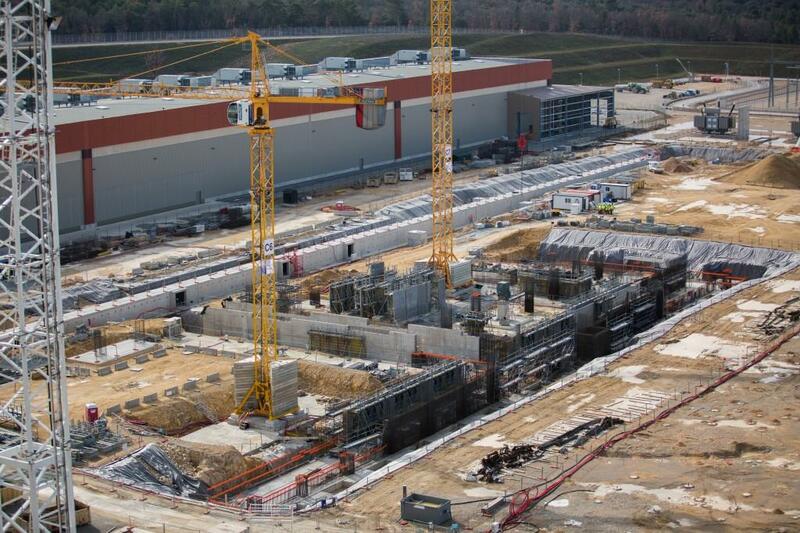 The ITER cryoplant will be capable of providing cooling power at three different temperature levels: 4 K, 50K and 80K. 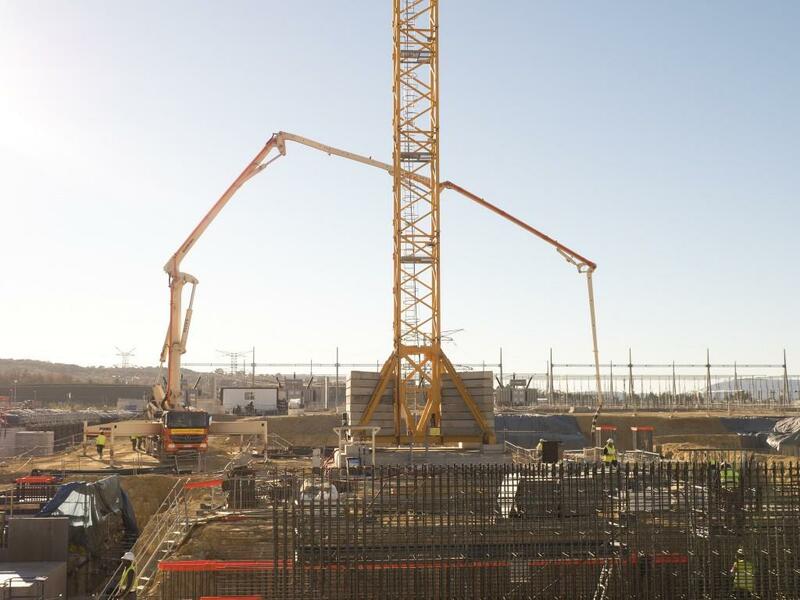 Currently, work is underway on the building's foundations. 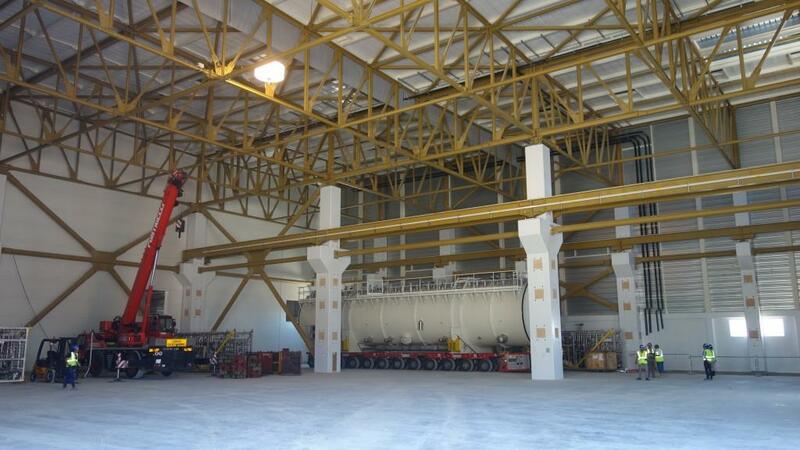 Work on the technical galleries of the cryoplant is almost completed. 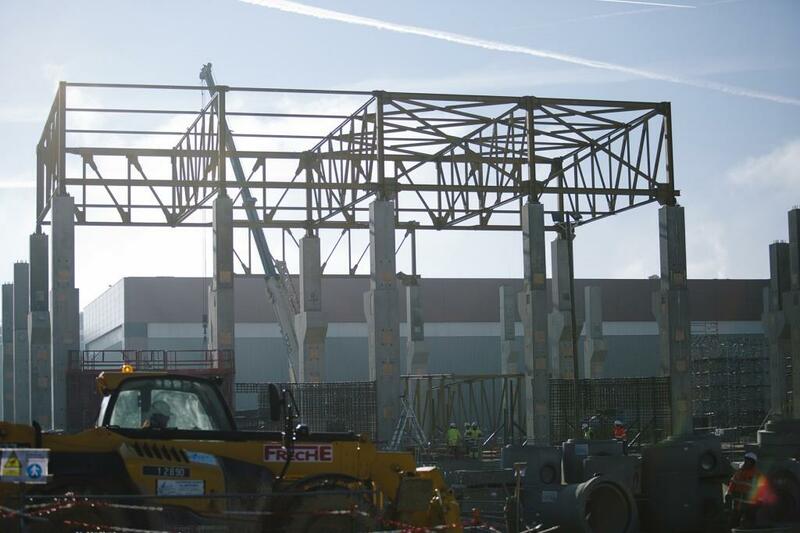 The floor slab and steel frame will follow ... in time to deliver the building in 2017. 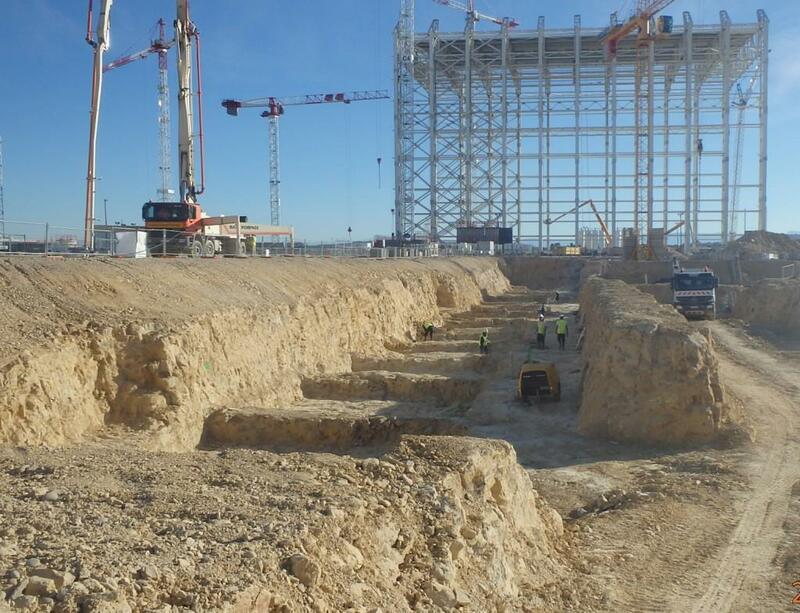 Excavation has started for the ITER Cryoplant Building near the Assembly Hall. 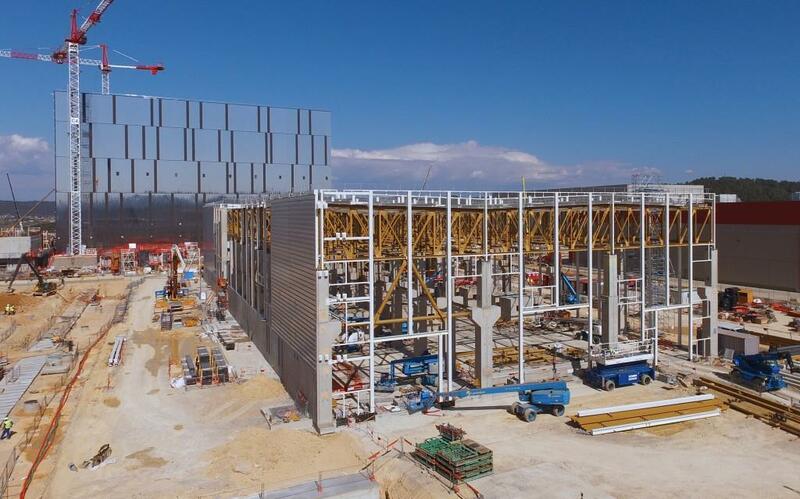 The 121-metre-long, 47-metre-wide and 19-metre-high Cryoplant Building will host one of the world's largest clusters of cryogenic equipment. 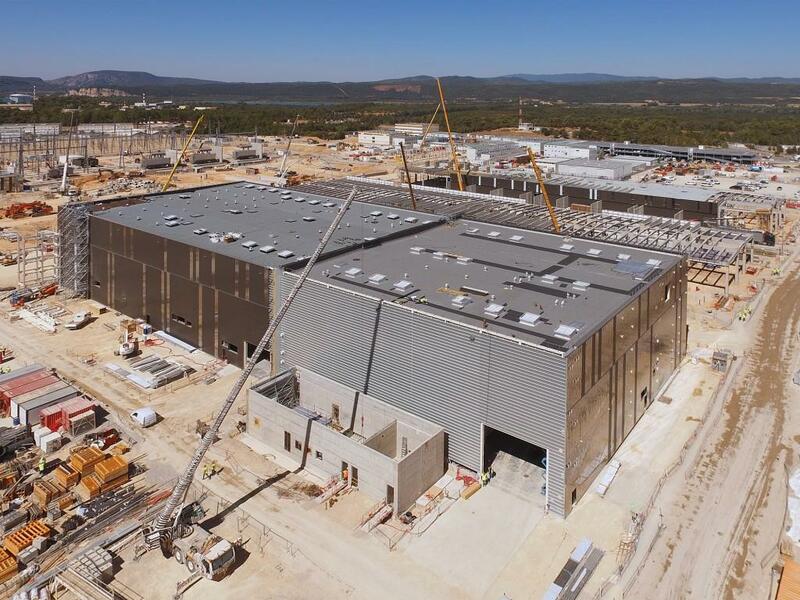 The ITER cryoplant comprises 5,400 m² of covered buildings plus a large exterior area for the storage of helium and nitrogen. 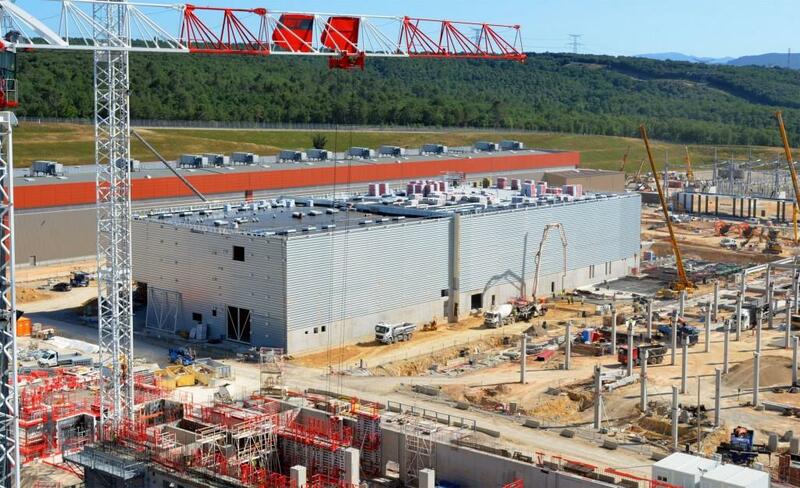 The extensive cryogenic power needed to cool the ITER magnets, thermal shield and cryopumps will be delivered from a single location on the ITER site—an 8,000 m² area not far from the Tokamak Complex that houses the cryoplant infrastructure. 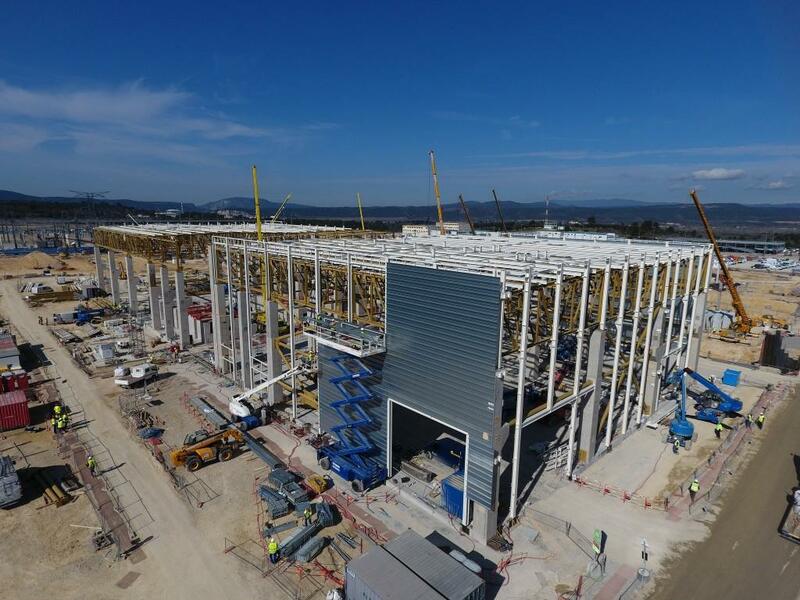 The soccer field-size installation under construction now comprises 5,400 m² of covered buildings plus a large exterior area for the storage of helium and nitrogen in liquid and gaseous forms. 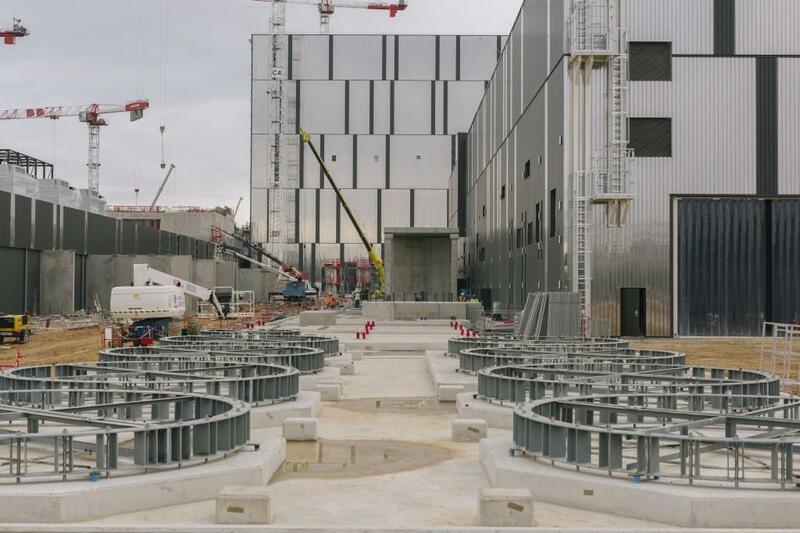 In the Cold Box Building, which occupies approximately 40 percent of the covered space, three identical helium refrigerators will work in parallel to provide liquid helium (LHe) to the major clients for cooling—ITER's 10,000 tonnes of superconducting magnets plus the cryosorption panels that ensure high-quality vacuum to the large volumes of the cryostat (8,500 m³) and vacuum vessel (1,400 m³). 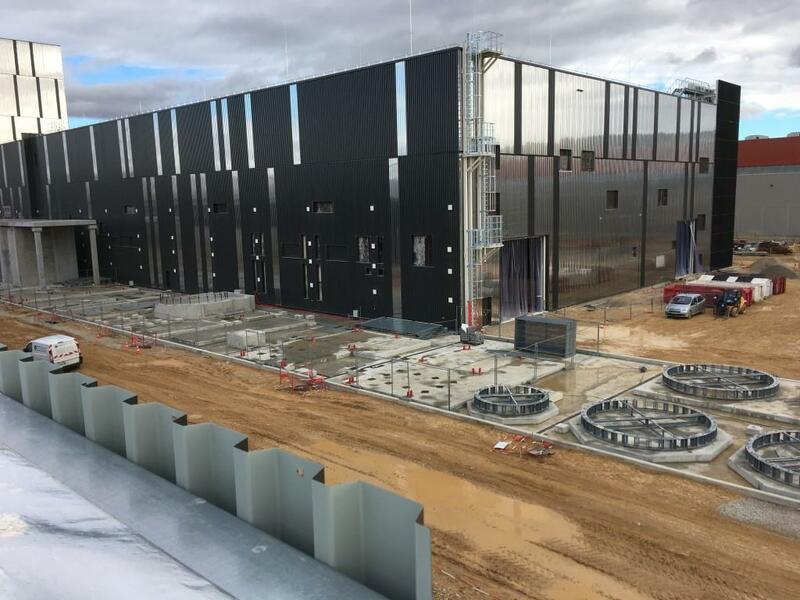 The three units will provide a total average cooling capacity of 75 kW at 4.5 K (-269 °C) at a maximum cumulated liquefaction rate of 12,300 litres per hour. 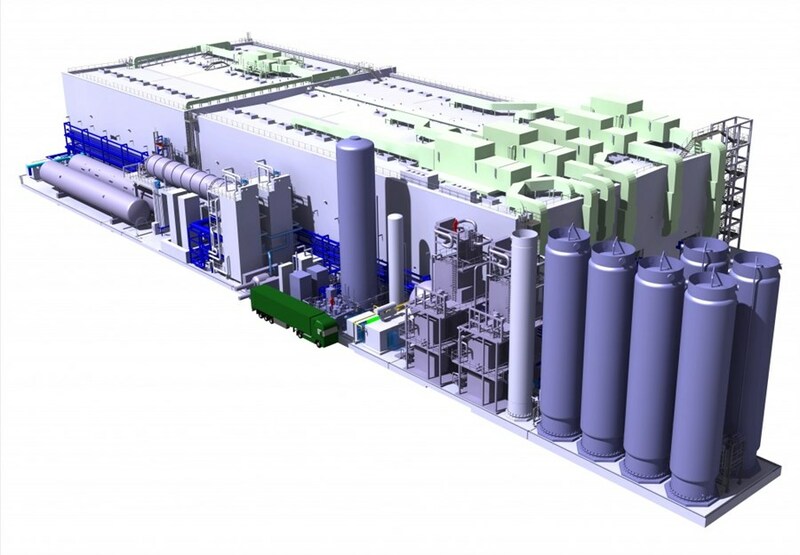 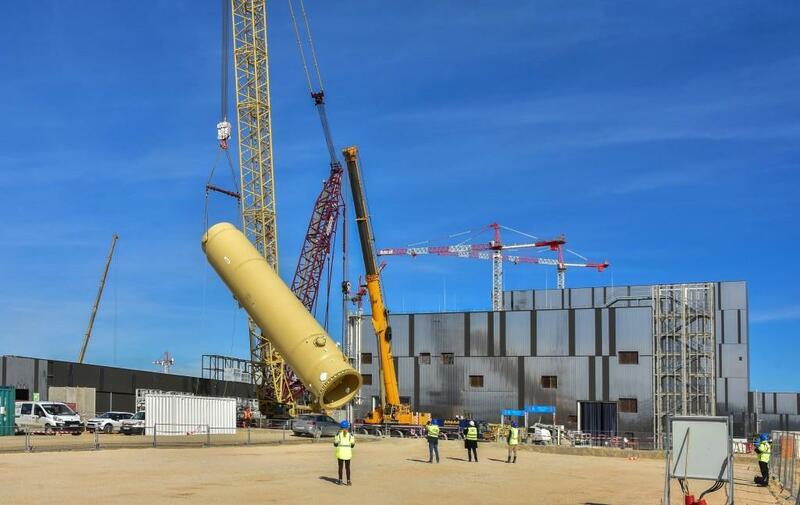 The cryoplant will also produce liquid nitrogen (LN₂) to be used as a ''pre-cooler'' in the liquid helium plant and for the refrigeration of the ITER thermal shield. 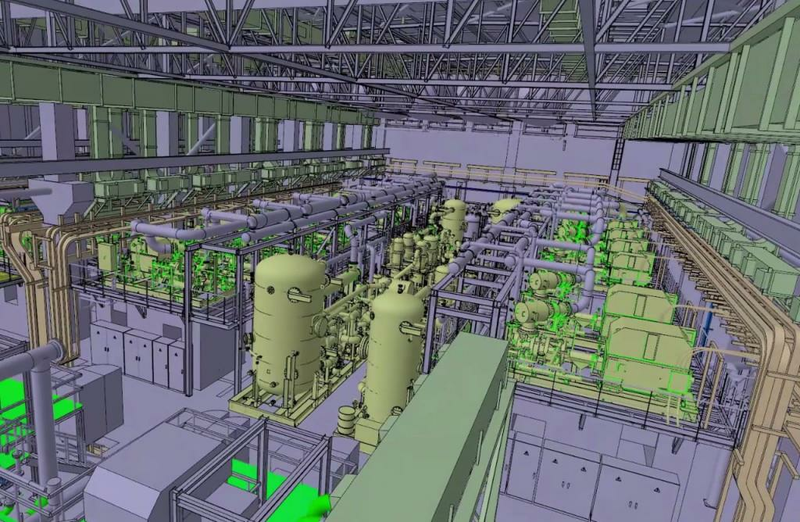 The compressors for the nitrogen plant will be housed in the Compressor Building, next to the 18 compressors that will be required for the operation of the helium refrigerators; the two nitrogen cold boxes will be located outside of the building in the exterior area. Lost nitrogen will be extracted directly from the atmosphere in a gaseous nitrogen generator with a production capacity of 50 tonnes per day, and then processed in the two liquid nitrogen refrigerators with a maximum capacity of 1300 kW at 80 K.
A heat recovery system will be installed in the Compressor Building to recover up to 12 MW of heat from cooling water that circulates to evacuate the heat generated by the compressors. 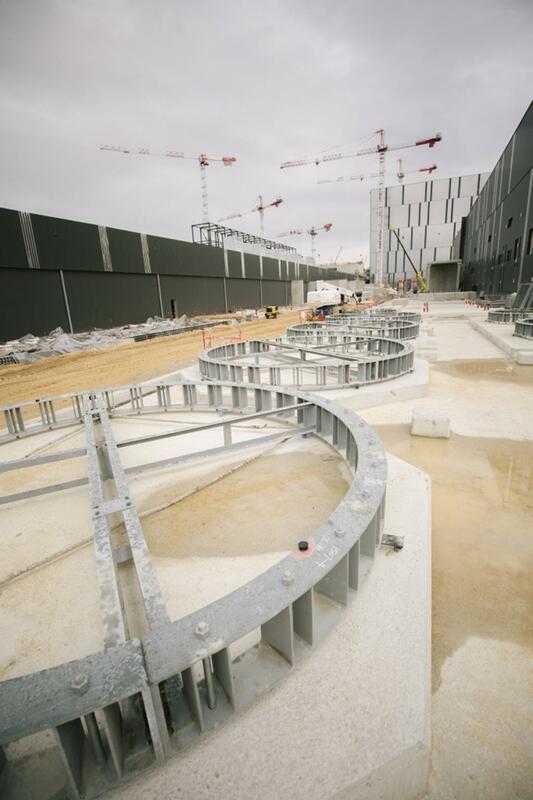 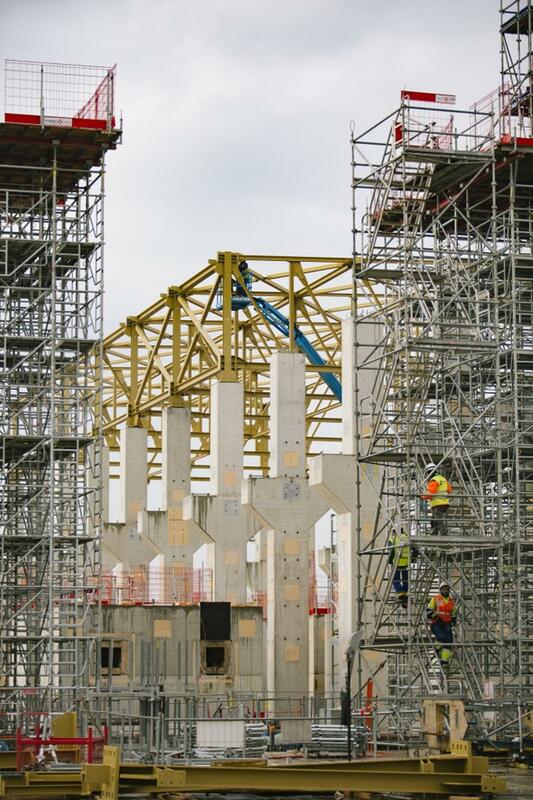 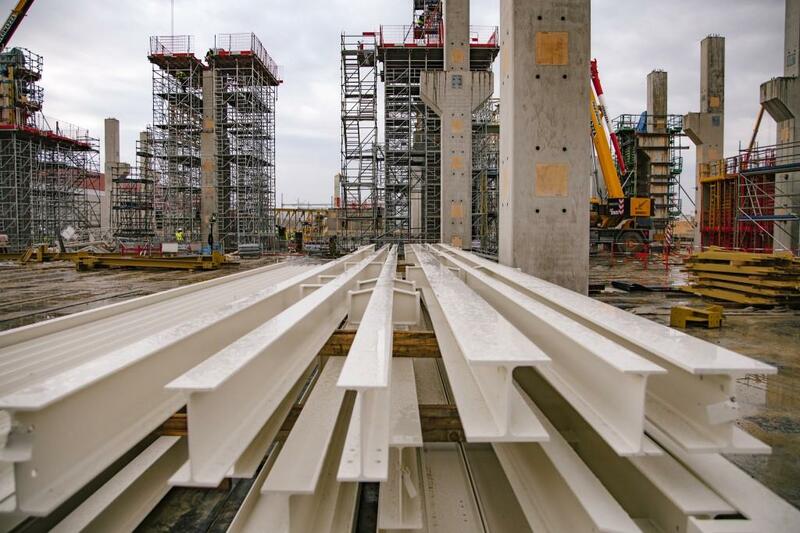 This recuperated thermal energy will be used in the heating of the ITER buildings themselves. 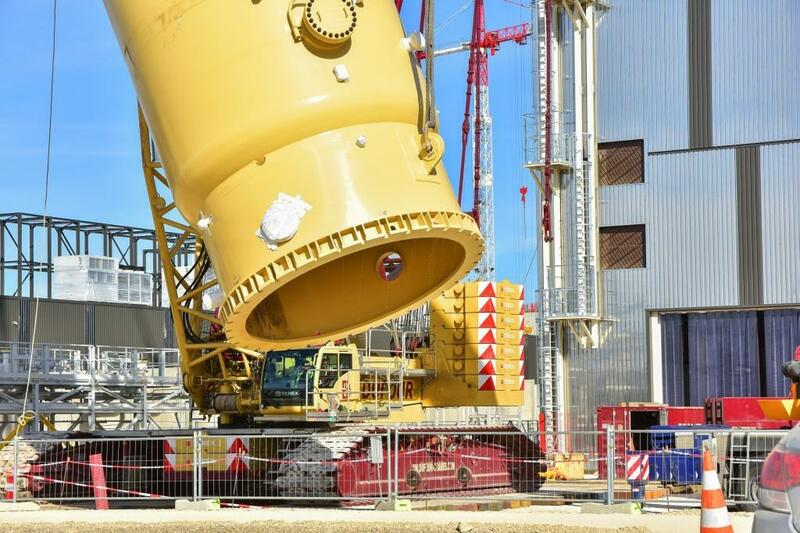 The LN₂ plant (blue, under the responsibility of Europe) will produce liquid nitrogen at a temperature of minus 196 °C to be used as a ''pre-cooler'' in the LHe plant (yellow, procured by the ITER Organization). 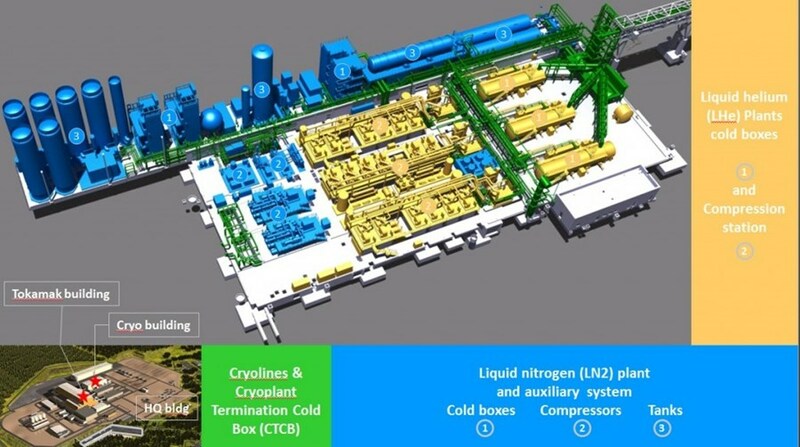 Nearly 25 tonnes of liquid helium—at minus 269 °C—will circulate through a five-kilometre network of pipes, pumps and valves procured by India (the first part of the network is shown in green) in order to cool the superconducting magnets, the thermal shield, vacuum cryopumps, and certain diagnostics. 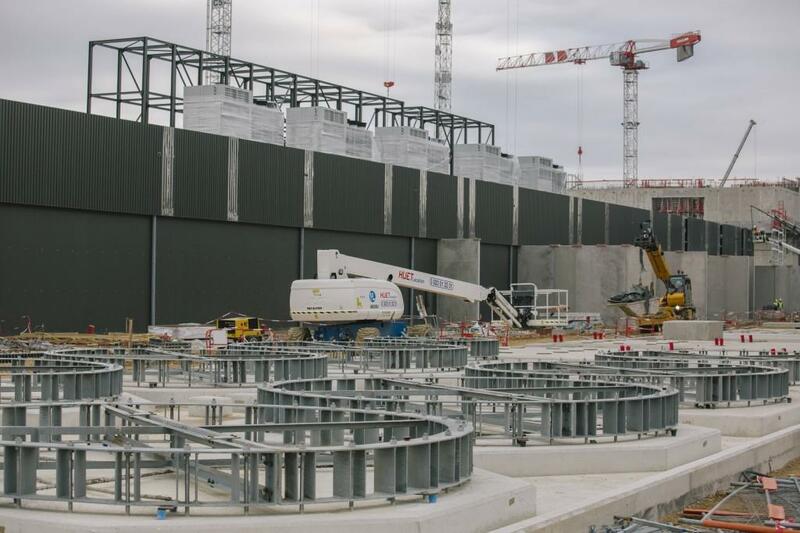 Cooling fluids generated in the cryoplant will travel along process lines installed 13 metres above platform level on a bridge that runs to the Tokamak Building; from there, approximately five kilometres of cryolines will distribute gas and liquid helium to the different "clients." 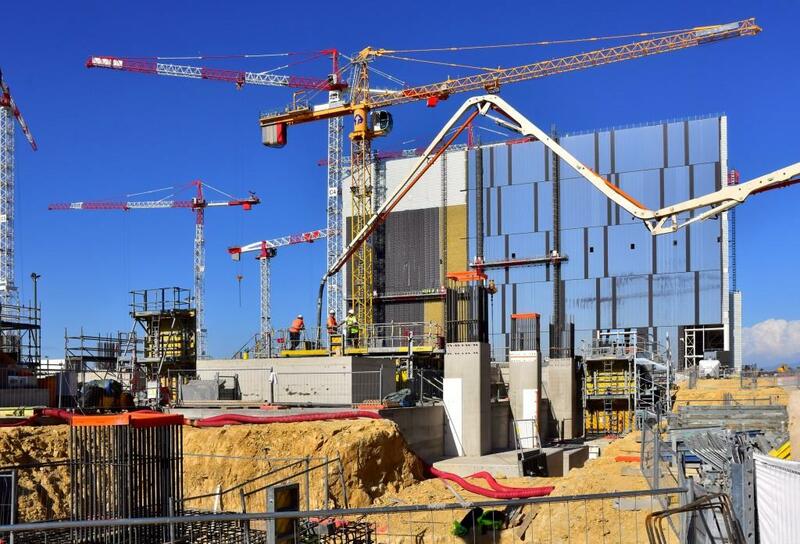 The ITER magnets will consume 45 percent of cryogenic power followed by the thermal shield (40 percent) and the cryopumps (15 percent). 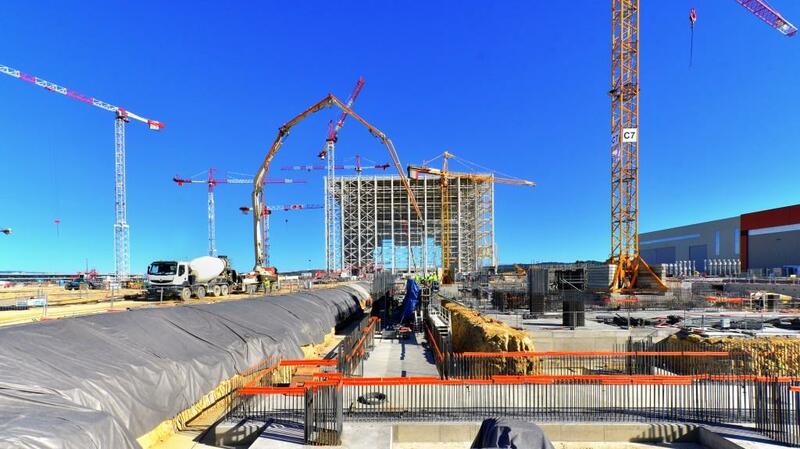 Nearly 25 tonnes of liquid helium at minus 269 °C will circulate in the ITER installation during operation. 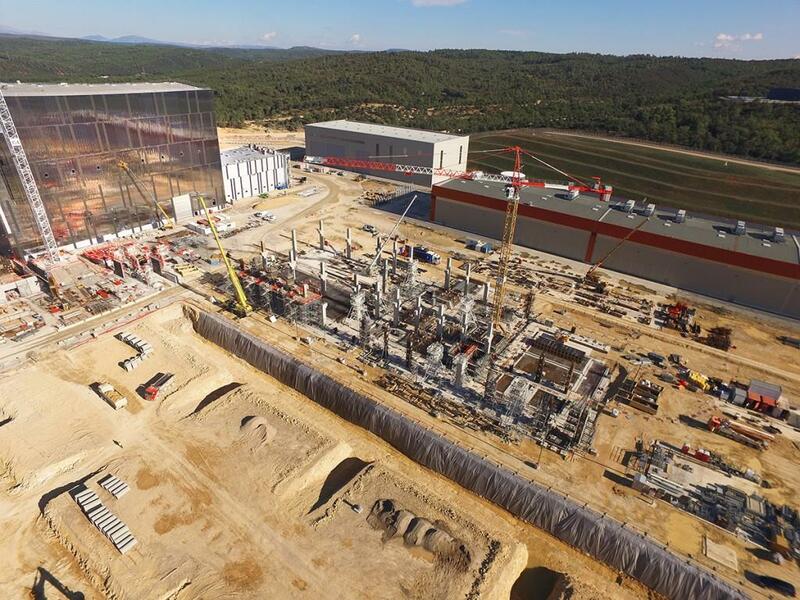 ITER's cryoplant has been designed to operate over a wide range of ITER plasma scenarios, from short plasma pulses (a few hundred seconds) with 700 MW of fusion power, to long plasma pulses of 3,000 seconds with 365 MW of fusion power. 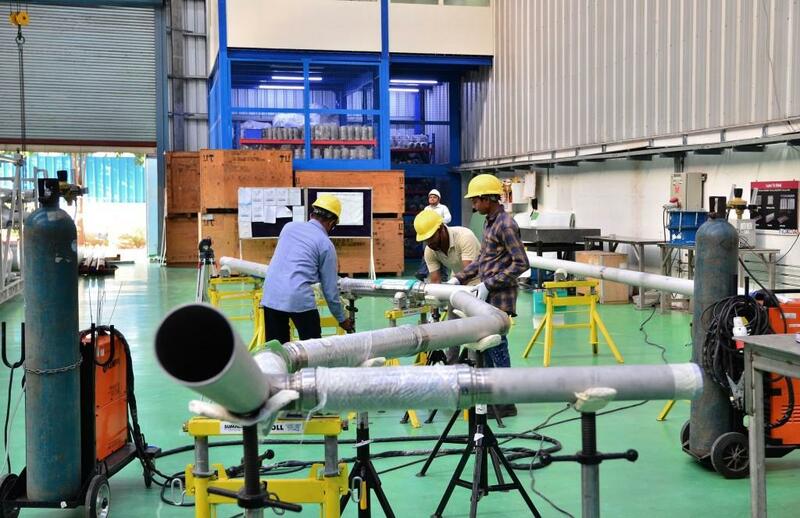 A number of unique features will also guarantee high reliability and availability despite unprecedented dynamic heat loads caused by magnetic field variations and fusion neutrons. 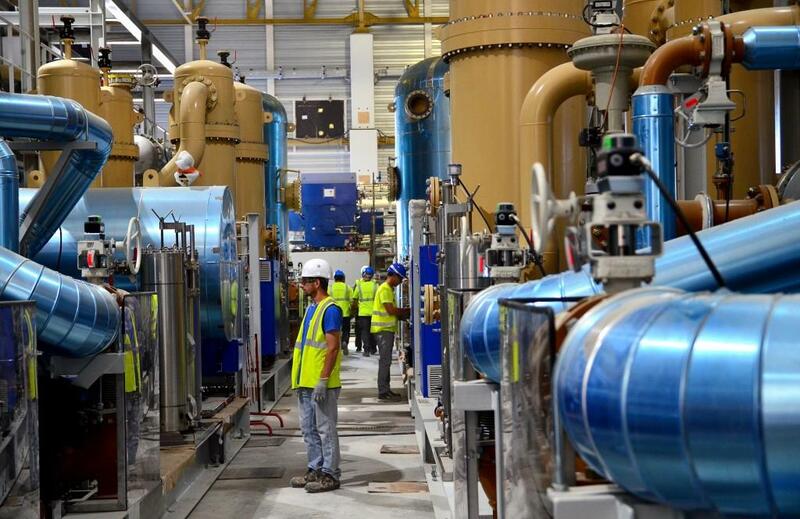 Three parties are sharing responsibility for the plant's procurement: the ITER Organization, responsible for the liquid helium plants; Europe, in charge of the liquid nitrogen plant and auxiliary systems as well as the construction of the cryoplant infrastructure on site; and India, whose contractors are procuring the cryolines, the warm lines and cryodistribution components. 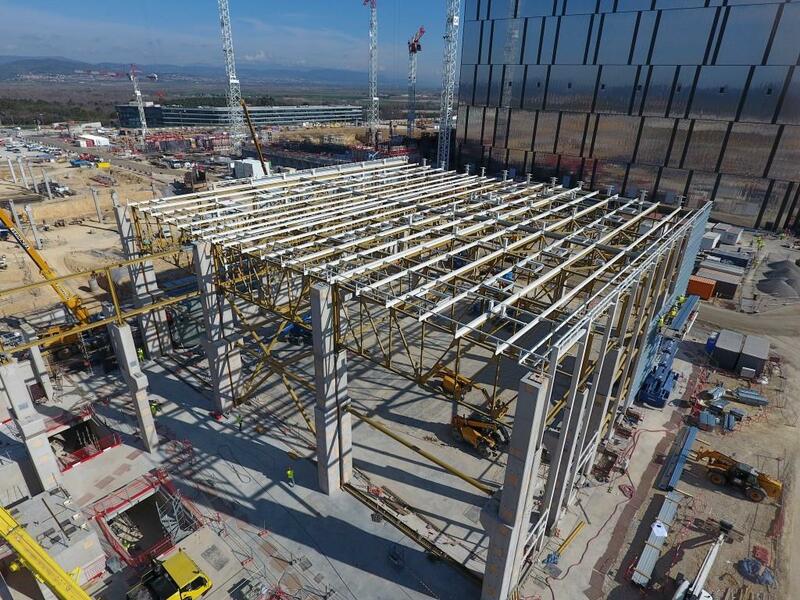 Construction of the ITER cryoplant was completed in 2017 and the majority of plant components have been delivered for installation by suppliers. 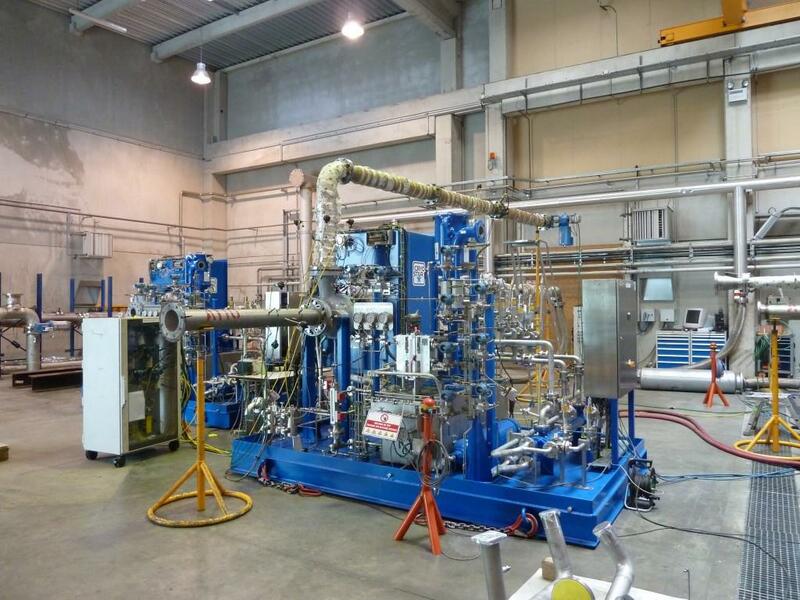 The first components (liquid helium cold boxes) were installed in June 2017. 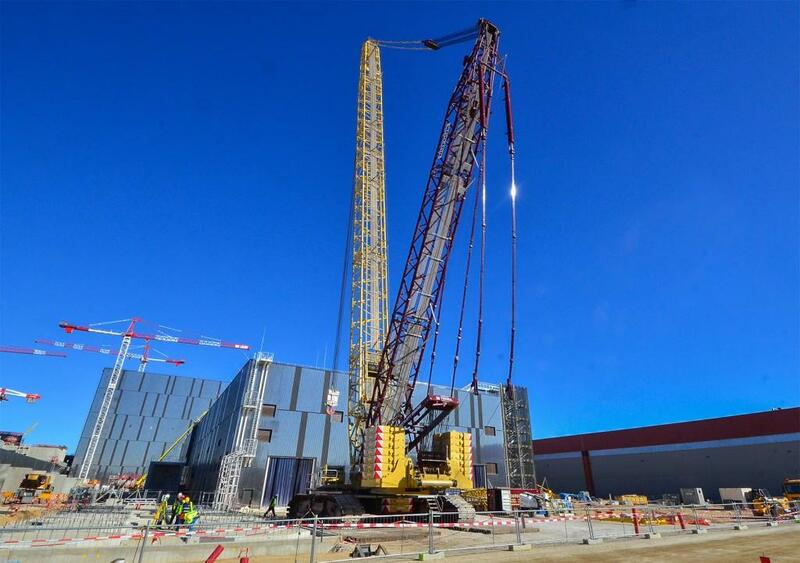 More on the use of cryogenic technology at ITER here. 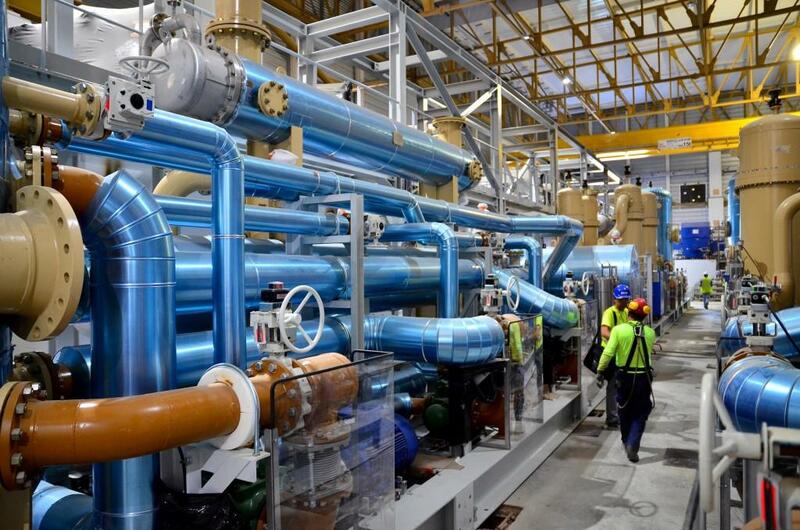 Watch a video on the biggest centralized cryoplant ever built here.